Estimated Dateline Early 17th Century. RARE SURVIVING COPY (LATER CUT DOWN) AFTER HANS HOLBEIN THE YOUNGERS WHITEHALL PALACE DYNASTY MURAL OF(1536-37)WITH LATER ADDITION OF CROWN. This composition is derived from the 'Dynasty Portrait' in which Henry VIII in 1537 commissioned Hans Holbein the Younger to create a mural of the Tudor dynasty to commemorate his son Edwards birth. Henry VIII ‘inherited’ Whitehall Palace after Cardinal Wolsey’s death in 1529. He spent a considerable amount of money on it and it was regarded as the largest 23 acre palace in Europe. It was here that Holbein created his largest and most important royal commission, the Whitehall mural executed in 1536, in which Henry was portrayed with his Queen Jane Seymour and his parents, Henry VII and Elizabeth of York. Sadly the palace burned down on 4-5 January 1698 when a laundry maid left washing drying in front of an open fire. Luckily, in 1667 the Flemish artist Remigius van Leemput (an assistant of Van Dyck) had produced a small copy of the great wall painting. It measured 88.9 x 98.7cm. This reduced version was created at the command of Leemput’s royal master King Charles II. The painting included Latin verses(originally painted on the front of rostrum/but not shown in our version) directing praise at the two male rulers. 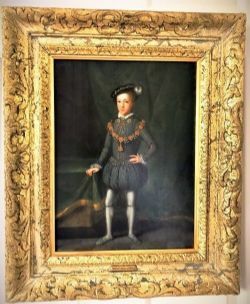 Paintings of the Kings and Queens of England such as this, or 'Long Gallery Sets' as they were known, were very popular in the 16th & 17th century & would be displayed in grand houses and castles. Hans Holbein the Younger (c. 1497-1543) was a German artist and official court painter to King Henry VIII. Son of Hans Holbein the Elder, Hans Holbein the Younger was arguably one of the greatest portrait artists of his time. Born in Augsburg, Germany,he was taught by his father. With a letter of introduction from his patron and mentor Erasmus, Holbein traveled to England for the first time in 1526. Holbein went on to paint many in the court of King Henry VIII, including Thomas More, Anne Boleyn, Jane Seymour and Anne of Cleves. Holbein later contracted what was likely the plague and died in 1547. 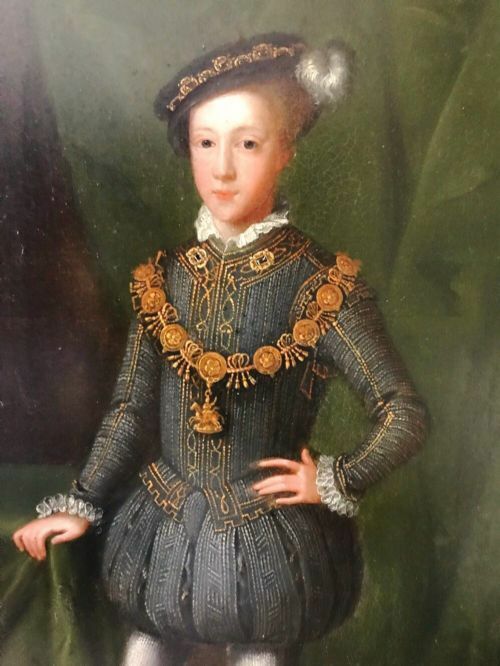 Henry was born in Wales, his mother was just 13 years old. His father Edmund died before he was born. His claim to the throne came through Margaret Beaufort,his mother,descended from John of Gaunt. 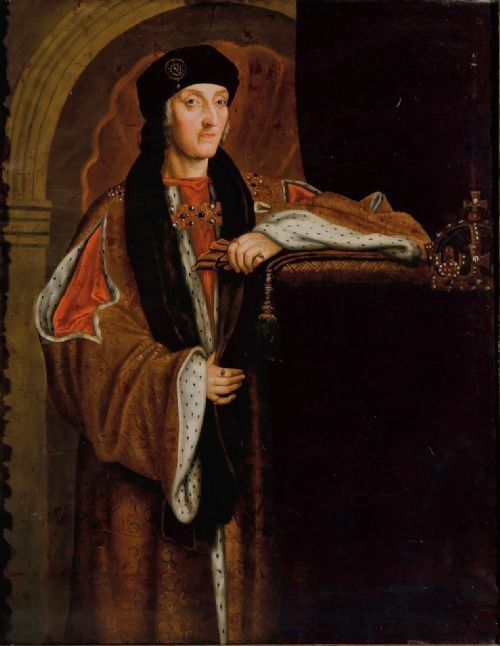 Henry died in 1509 at Richmond Palace, he is buried at Westminster Abbey and was succeeded by Henry VIII. Very good condition for approx 400 + years of age.Signs of a hand woven reline some 200+ yrs ago Craquelure,old repair(dark area) & slight scuffs. 17thc hand made wooden gilt frame,with tulips,fruit flowers, english roses,acorns and ribbons. 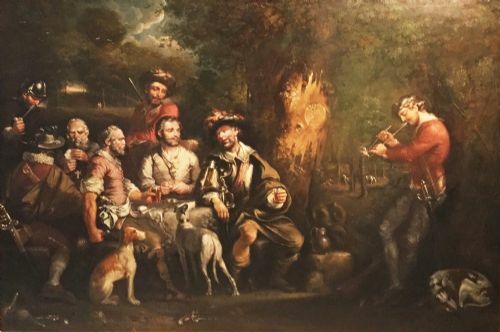 A Fine 18thc Large Scale Oil Painting on canvas depicting a group of bearded Bandits drinking ale and smoking their clay pipes in their encampment in Dalby Forest near Mainsforth Hall,Mainsforth County Durham. The moonlit evening sky illuminates their faces. The bandits are depicted with three of their working dogs both resting by their owners sides. In the forground a muskett can be seen lying on the dusty ground,with a large jug resting on a stone. One Bandit is seen playing a hand of cards. MAINSFORTH, a township in Bishop-Middleham parish, Durham, on the river Little Skerne; near the Darlington railway, 7½ miles E of Bishop-Auckland. Acres, 627. Real property, £586. Pop., 58. Houses, 10. Mainsforth Hall belonged to the Huttons; passed to the Surteeses; and is notable for the residence in it of the late Robert Surtees, the county historian and antiquary. Sir Walter Scott often visited it; and he planted an oak tree, which flourishes at the end of the houseterrace. Mainsforth is a small village in County Durham, in England. It is situated to the east of Ferryhill, and lies within the ecclesiastical parish of Bishop Middleham The earliest settlement in Mainsforth may have been on Marble (Narble Hill). Mainsforth Hall was a significant building in the centre of this small village, until its demolition in the 1960s. The Hall was for many years the dwelling of the Surtees family. The most famous member of the family was Robert Surtees (1779-1834), the great County Durham historian. Today the hamlet contains several farms and older cottages and some modern executive style detached dwellings. It retains its character principally because of the many trees in the village and because of the retention of the wall of Mainsforth Hall in the centre of the village. Lord Robert Surtees, a descendant of the ancient family of Surtees of Low Dinsdale Manor also acquired the old manor house and estate at Redworth. Redworth Hall is a 17th-century country house at Redworth, Heighington, County Durham, England now converted to a hotel. It is a listed building. Robert Surtees The Elder carried out substantial rebuilding work in 1744, incorporating some of the 17th fabric. He created an impressive sandstone mansion of two storeys and gabled attics to which further extensions were added in 1820 by his nephew and heir, Robert Smith Surtees who High Sheriff of Durham in 1855. Robert Surtees (antiquarian) of Mainforth Hall (now demolished) was a great nephew of the elder Robert. The Surtees family lived at Redworth until the death in 1955 of Henry SB Surtees (High Sheriff in 1929). 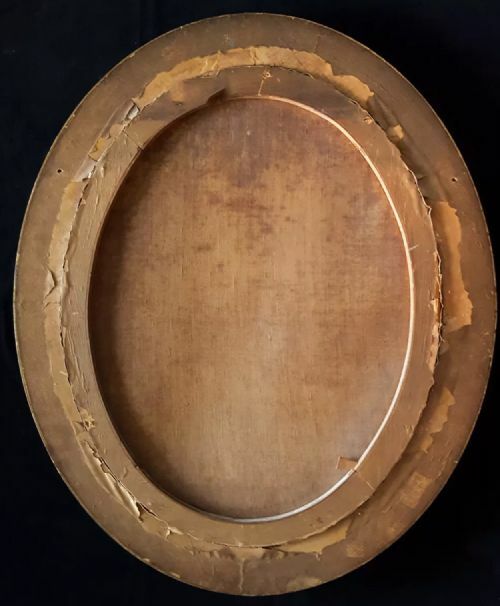 FRAME: This very decorative swept frame is craftman made to a high standard and is finished in a rich antique gold leaf with moulded canthas leaf design. 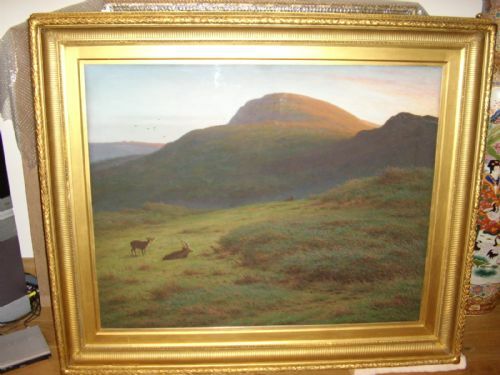 CONDITION: The canvas has a good secure old relining and one tiny patch,well repaired to rear. 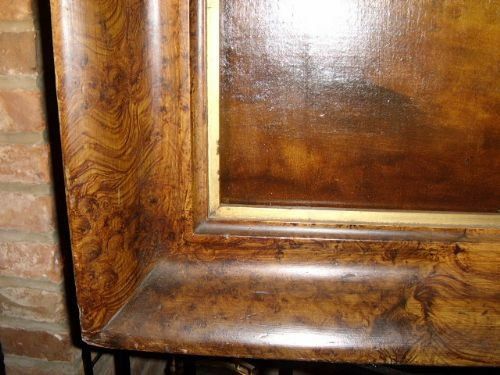 The painted surfaces are stable with only minor craquelure,still retaining the original rich colours. 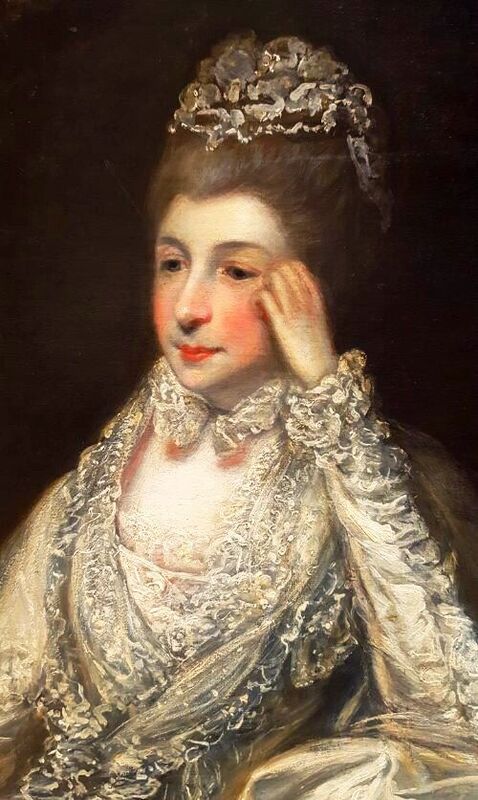 There are slight signs of some careful minor retouching as expected after 240 yrs. There are no thinned or faded areas. Painted as a moonlit scene in a darkened forest setting, this painting benefits greatly from having a strong picture light above the canvas. Last sold at the NEC Birmingham. 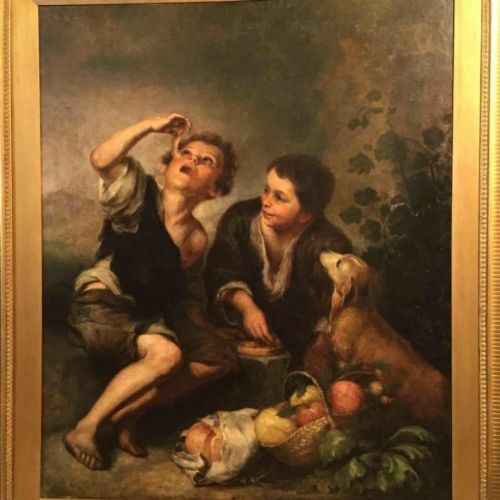 A fine oil painting titled "The Pie Eaters" after the original work of art painted back in the mid 17th century by the renowned and talented Spanish artist Bartolomé Esteban Murillo. A well painted correct full scale version from the early 19th century (1800-1820)and finished with the same style of brush stroke and realism seen in the original work,very much like an old master. This fine version being painted with warmth and charm achieved in the original,currently in the Alte Pinakothek museum in the Kunstareal in Munich. The condition of the canvas is good,having been relined many years ago,and still holding firm. 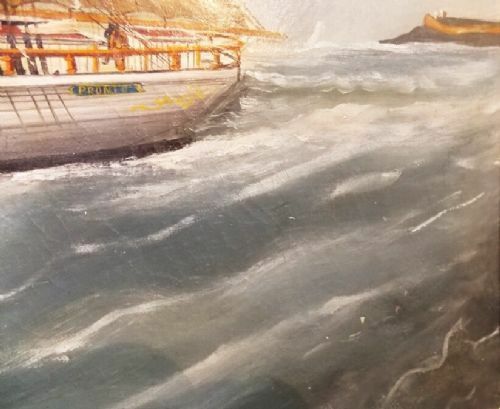 The painted surfaces have some signs of being carefully retouched and lighly revarnished although this is difficult to see,as the style and texture of this fine painting has a consistant flow. 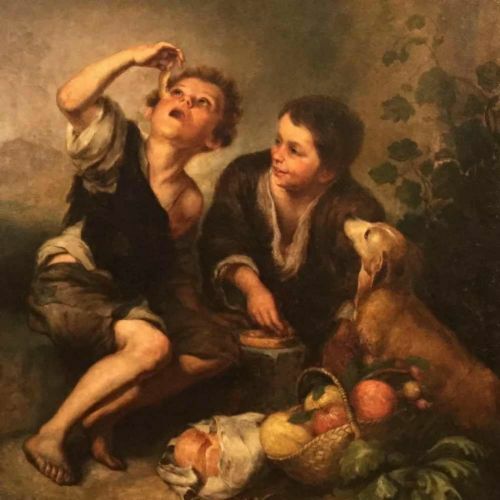 Great warmth and charm is felt when in the presence of this amazing painting,which under subtle lighting has a depth and realism flowing from the charactors,being two young hungry boys eating a pie under the nose of their dog. 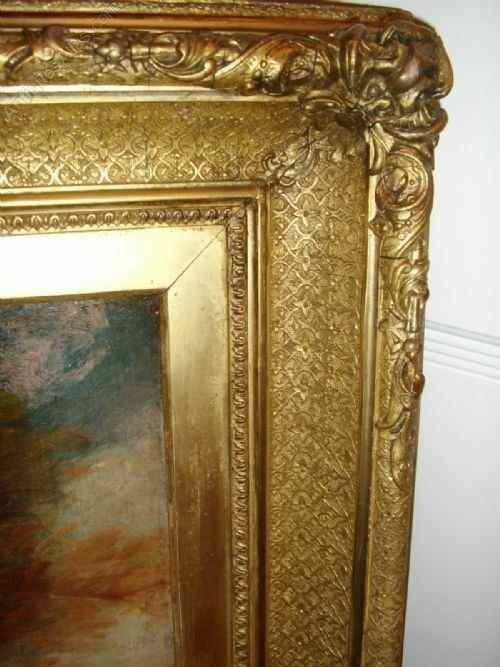 FRAME : An original plaster and gilt swept frame in good solid condition,having just a few old repairs. Bartolomé Esteban Murillo (born late December 1617, baptized January 1, 1618 – April 3, 1682) was a Spanish Baroque painter. Although he is best known for his religious works, Murillo also produced a considerable number of paintings of contemporary women and children. These lively, realist portraits of flower girls, street urchins, and beggars constitute an extensive record of everyday life of his times. 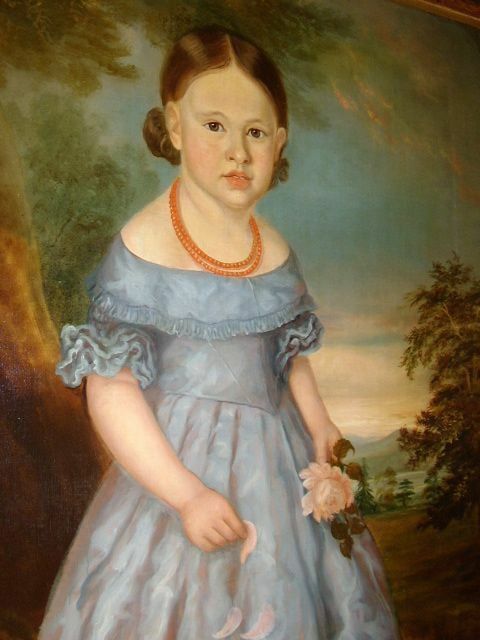 LIFE: Murillo was born to Gaspar Estaban Murillo and Maria Perez. He may have been born in Seville or in Pilas, a smaller Andalusian town. It is clear that he was baptized in Seville in 1618, the youngest son in a family of fourteen. His father was a barber and surgeon. His parents died when Murillo was still very young, and the artist was largely brought up by his aunt and uncle. Murillo married Beatriz Cabrera in 1645; their first child, named Maria, was born shortly after their marriage. The mother and daughter became the subjects of two of his paintings: The Virgin of the Rosary & Madonna / Child. CAREER: Murillo began his art studies under Juan del Castillo in Seville. Murillo became familiar with Flemish painting; the great commercial importance of Seville at the time ensured that he was also subject to influences from other regions. His first works were influenced by Zurbarán, Jusepe de Ribera and Alonzo Cano. In 1642, at the age of 26, he moved to Madrid, where he most likely became familiar with the work of Velázquez, and would have seen the work of Venetian and Flemish masters in the royal collections; the rich colors and softly modeled forms of his subsequent work suggest these influences. He returned to Seville in 1645. In that year, he painted thirteen canvases for the monastery of St. Francisco el Grande in Seville. He died in Seville in 1682 at the age of 64. LEGACY: Murillo had many pupils and followers. 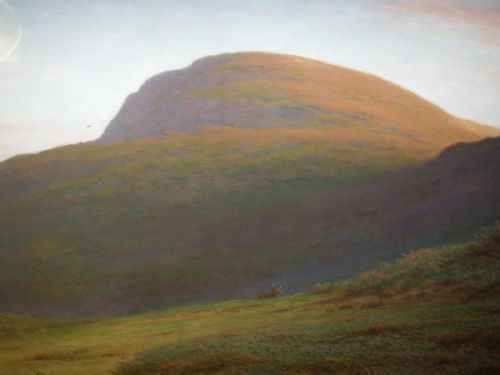 The prolific imitation of his paintings ensured his reputation in Spain and fame throughout Europe, and prior to the 19th century his work was more widely known than that of any other Spanish artist. 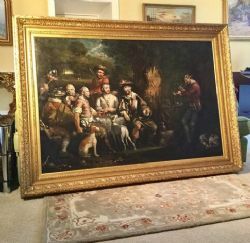 Interesting Article Link ( Copy & Paste ) About copies of masters selling at high price in auctions. 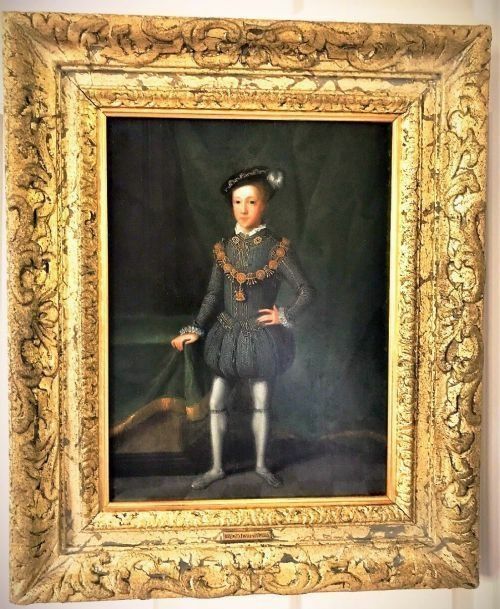 I am delighted to offer this rare oil on panel of King Edward VI (1537-1553) as a young child of around 10 years of age which has been painted with great detail as a full length passage portrait in the Manner of William Scrots and set within a later 18th century decorative plaster mounded gilt frame.The portrait is estimated to date from 1670-1700 and is a rare and unique surviving historic work which any museum or private collector would be excited to own as a display piece or investment. The image is unusual, broadly similar but not quite the same as the various 'Scrots' templates. However the identical image, same size, panel, etc is in the collection at Trinity College, Cambridge. 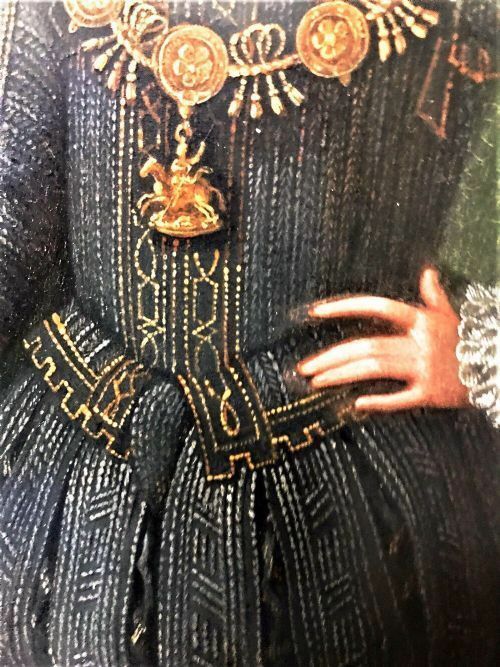 As an official royal likeness portraits of this type were in circulation from circa 1550 and were particularly favoured by noble families who wished to demonstrate their allegiance to the monarchy. 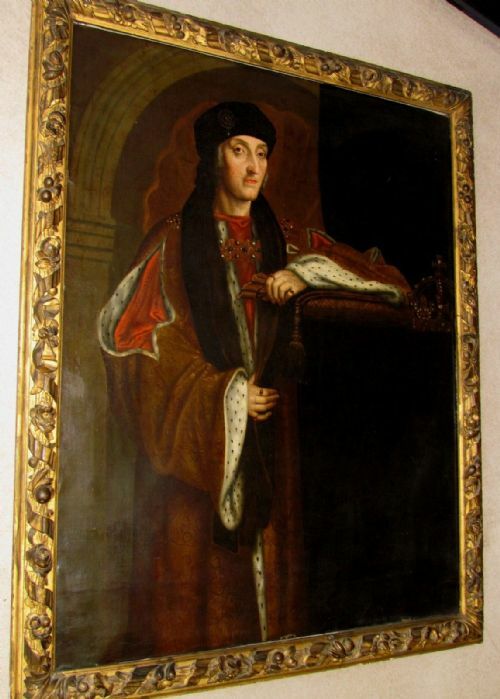 This portrait was almost certainly one of a group of corridor portraits designed to hang beside fellow monarchs and men and women of rank and historical note. EDWARD VI (1537-1553) was King of England and Ireland from 28 January 1547 until his death. He was the only legitimate son of Henry VIII and his third wife, Jane Seymour. He was born at Hampton Court on October 12th, 1531, His mother dying 12 days later. The heir to the throne, ''His Majesty's most noble jewel'', was brought up with every precaution to ensure his good health. Recent research reveals him as a normally strong and healthy boy, fond of athlethic exercises such as hunting and hawking. 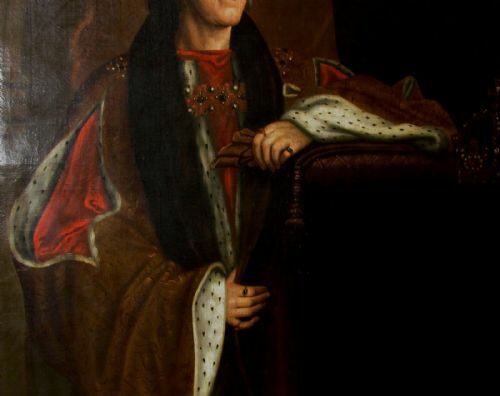 Edward was little more than nine when he succeeded to the throne on the death of his father in 1547. 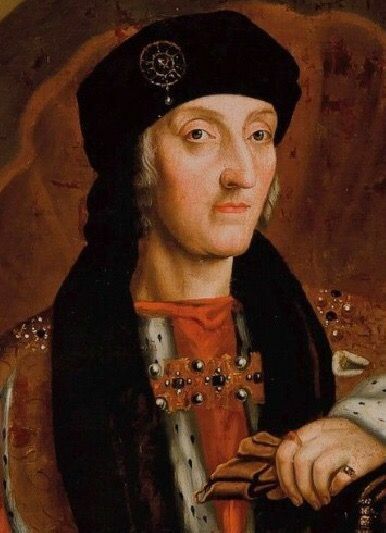 In April 1552 he suffered from measles and smallpox, recovering by the end of May, and thereafter he was very much under the influence of the Duke of Northumberland. After his accession to the throne, Edward appears to have sat only once more for his portrait in around 1550 and was painted by William Scrots. 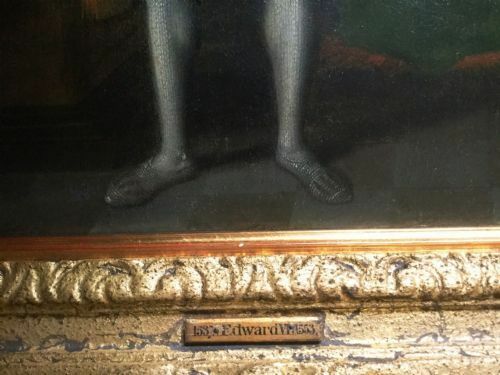 This sitting was the likely source for all subsequent variants, in all shapes and sizes, produced of Edward as the King by the Scrots studio, both during the monarch's brief reign and after Elizabeth I's accession and the subsequent re-affirmation of the Protestant faith. Scrots had been court painter to the Regent of the Netherlands, Mary of Hungary , and was recruited by Henry VIII as Holbein's successor at the close of 1545. His work, covering less than 10 years in this country, has never been satisfactorily reconstructed. One certain work can be associated with him from this period - the distorted perspective portrait of Edward dated 1546 (National Portrait Gallery, London). This bore the signature ''Guilhelmus pingebat'' as late as 1713. WILLIAM (GUILLIM) SCROTS fl.1537-1553. Court portrait painter from the Netherlands. Painter to Mary of Hungary, Regent of the Netherlands,1537, and persuaded to come to England in 1545, probably to succeed Holbein. 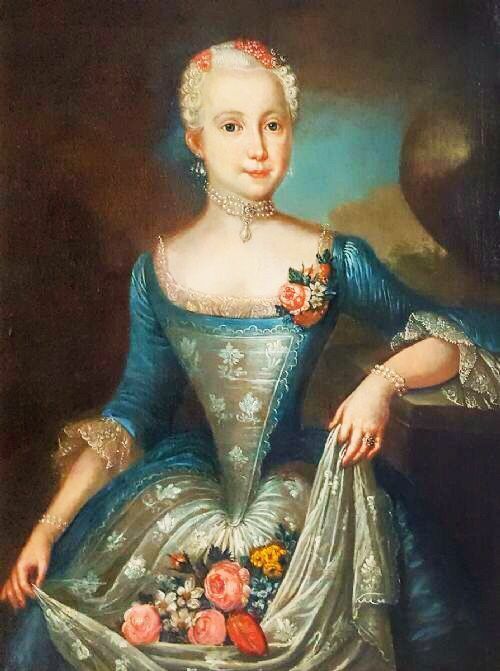 He was perhaps the most able available Hapsburg Court portrait painter at the time. He disappears from the Royal Accounts in 1553. Charles James Toovey Esq., Harley House, Regents Park, London. Then by descent through the family at Middleton House, Longparish, Hampshire. 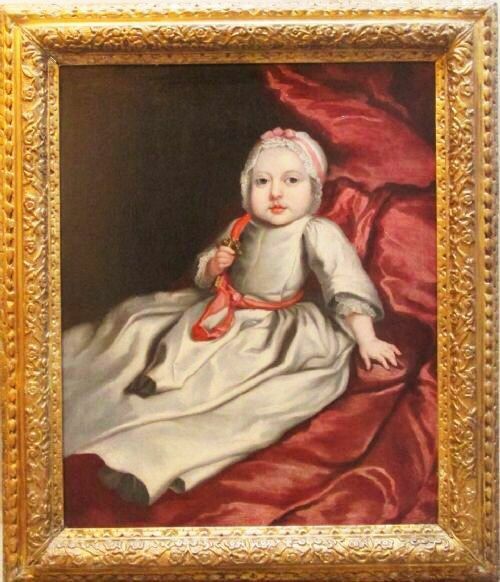 Fine Rare Late 17thc Oil Portrait of a Baby holding a coral teether. Mary Beale (née Cradock; late March 1633 – 8 October 1699) was one of the most successful professional female Baroque-era portrait painters of the late 17th century due to her perseverance of her business. Praised by Richard Gibson and court painter Peter Lely, she is considered as successful as Joan Carlile. 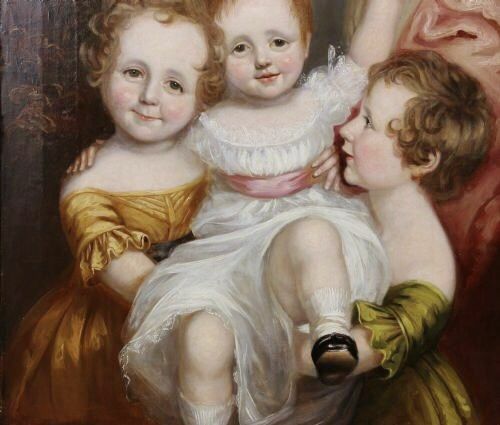 Joan Carlile was also an English portrait painter, who was one of the first women to practise painting professionally. 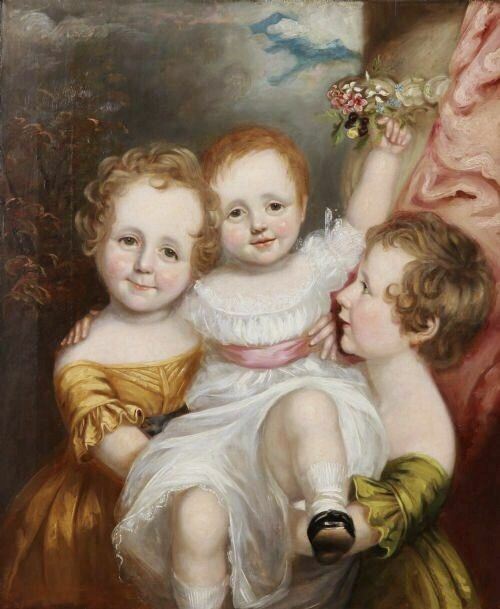 Mary Beale managed to be the financial provider for her family through her professional portrait business. Mary Beale stood apart from other women due to her outspokenness and successful business that allowed her to be the breadwinner of the family. 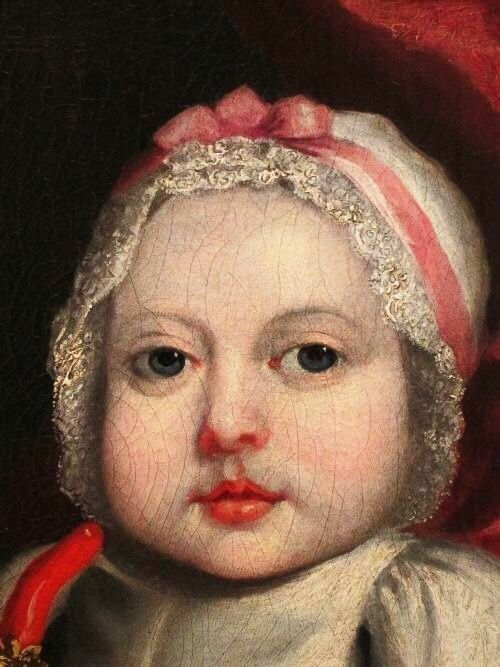 Portraits of babies from the 17th & 18th centuries are quite rare, and obviously desirable for their charm and appeal. This delightful portrait of a round-cheeked, blue-eyed infant is posed using the conventions established for formal European court portraiture, and as found in other early portraits of royal or aristocratic infants. 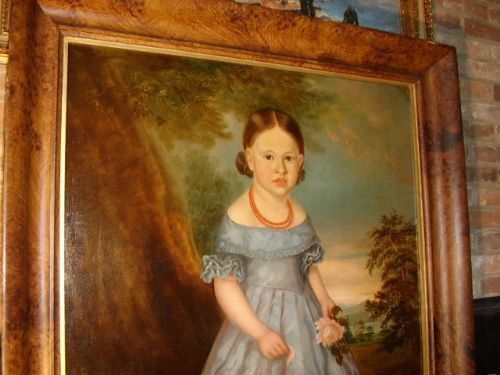 The child is depicted full-length, sitting with a highly formalised velvet curtain drape in the background. 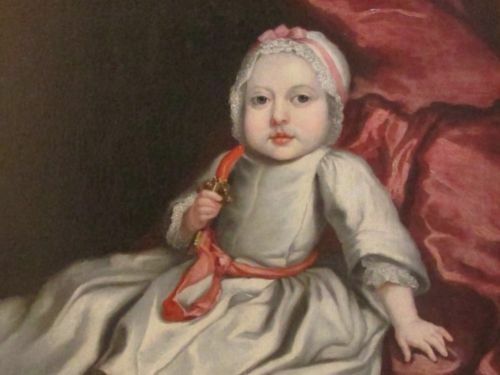 As with other royal and noble portraits, the baby is shown propped up as if on a chair of state, and seemingly possessing the self-control and formal bearing normally found in portraiture of adults at court. 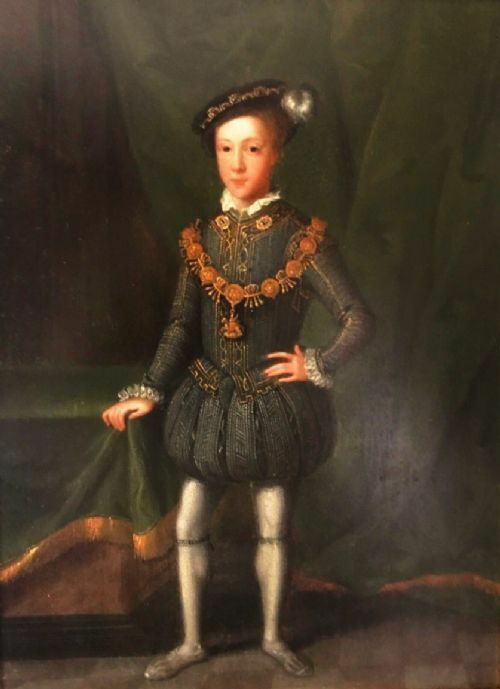 The absence of a family armorial, combined with a lack of knowledge as to the portrait’s original provenance, make the identification the child problematic. 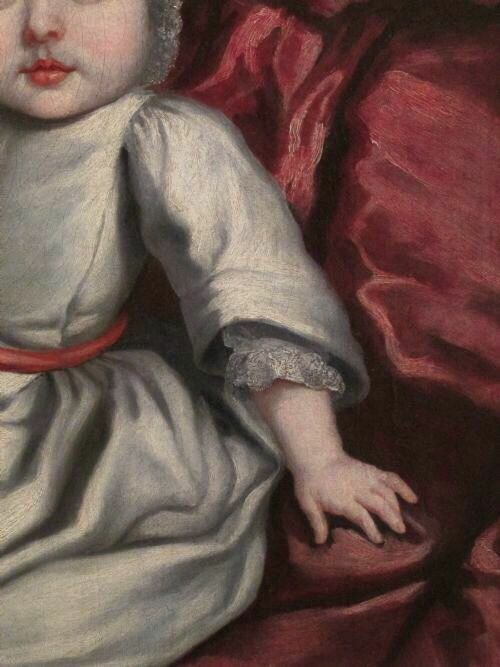 However the scale and richness of composition, with the baby dressed in the finest and most expensive white satin dress trimmed with lace and holding an expensive hand crafted coral teether,suggests that at the very least, this is a child from an wealthy family. The prominence of the coral teether in the picture reflects the traditional belief that coral has magical protective properties. It was thought that coral could ward off illnesses and evil spirits. Coral was also hard, cool and clean, making it ideal as a material for the teething infant. In fact, the coral’s rich colour was thought to reflect the appearance of physical well-being and if the coral began to change colour it was a harbinger of illness. 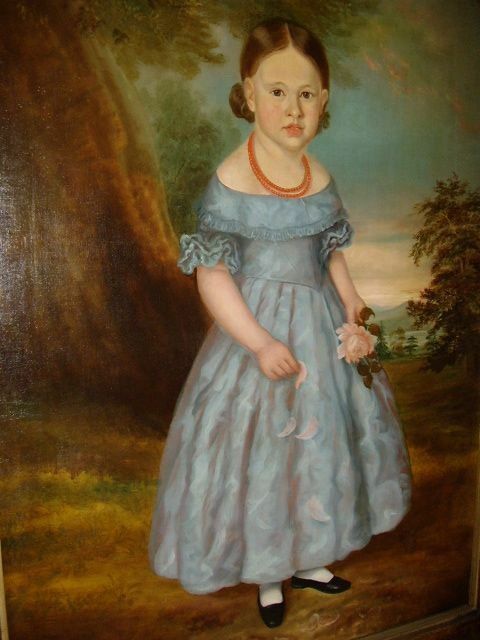 The baby in this portrait is wearing pink ribbons, it is interesting to note that the colours pink and blue were not associated with the gender of children until the 20th century. 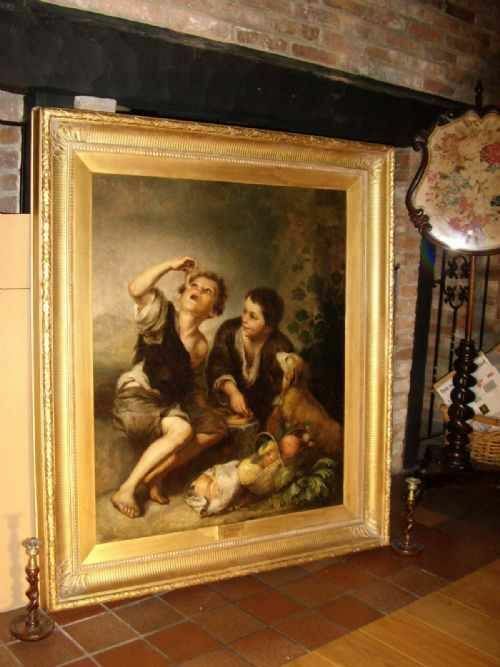 Presented in a good 18th century carved wood frame. Worldwide Quotes Available on Request. 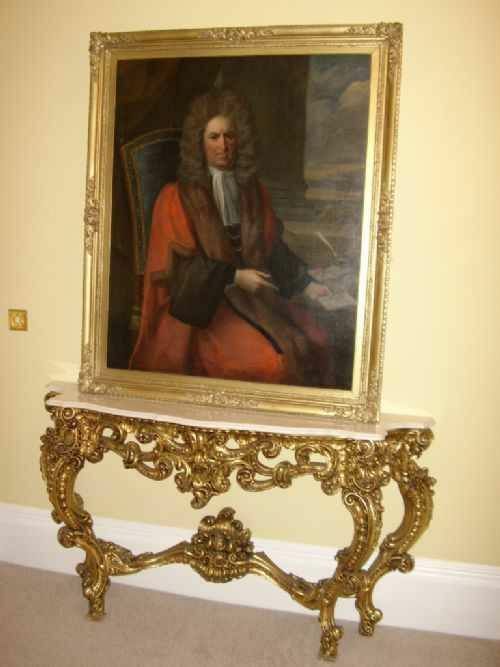 A fine three quarter late 17th century oil portrait on canvas presented in a period carved wooden gilded frame. DAVID 2ND EART WEMYSS wears his full suit of gleaming armour almost tailored to his substantial size,a weightly looking gentleman of distinction and aristocratic social standing. 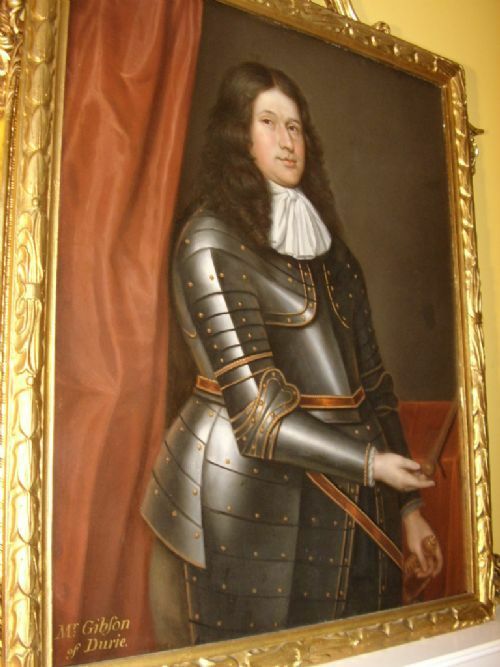 David Wemyss, 2nd Earl of Wemyss (6 September 1610 – July 1679) was an army officer. Only son of John Wemyss, 1st Earl of Wemyss and Jean Gray (d. 1640), daughter of Lord Gray. 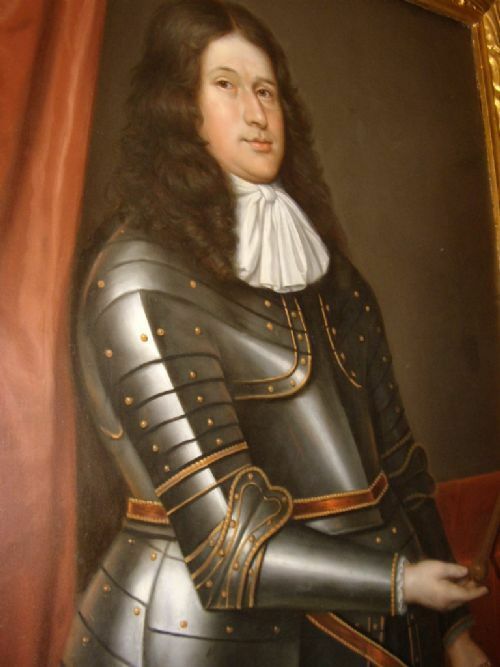 As Lord Elcho, a title he held between 1633 and 1649, he commanded a regiment of Fife infantry in the Scottish army which reached Newcastle upon Tyne in August 1640. 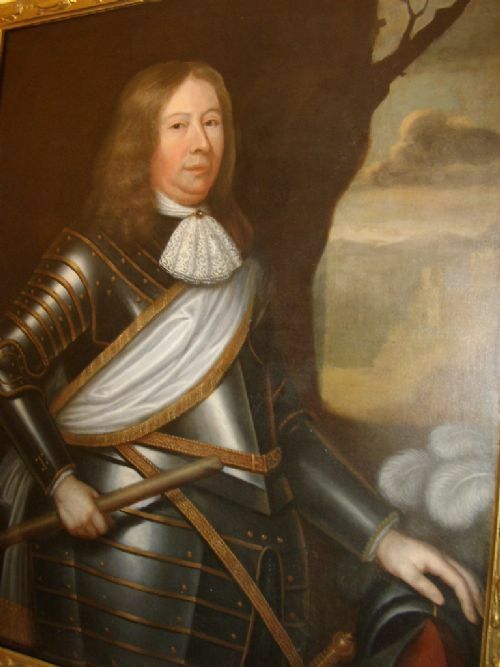 On 1 September 1644, at the head of about 6000 men, he was routed by Montrose at Tippermuir, and in August 1645, as supernumerary commander to Lieutenant-General William Baillie, again suffered defeat by Montrose's forces at Kilsyth. 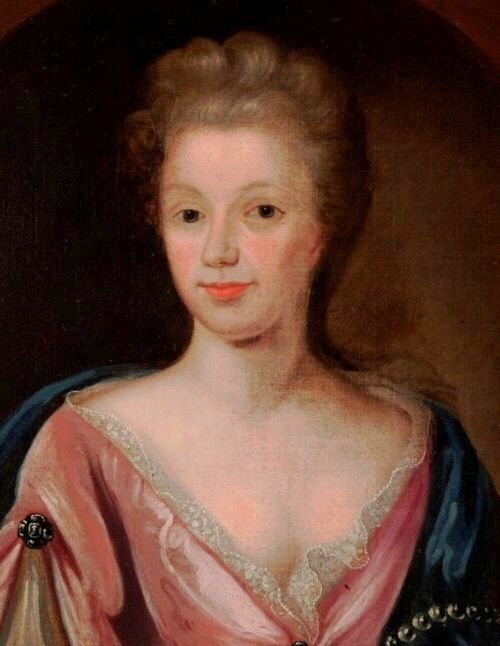 (13 January 1653) Margaret (d. 1688), daughter of John Leslie, 6th Earl of Rothes, and widow of Francis Scott, 2nd Earl of Buccleuch; one daughter, Margaret, the only child to outlive her father. 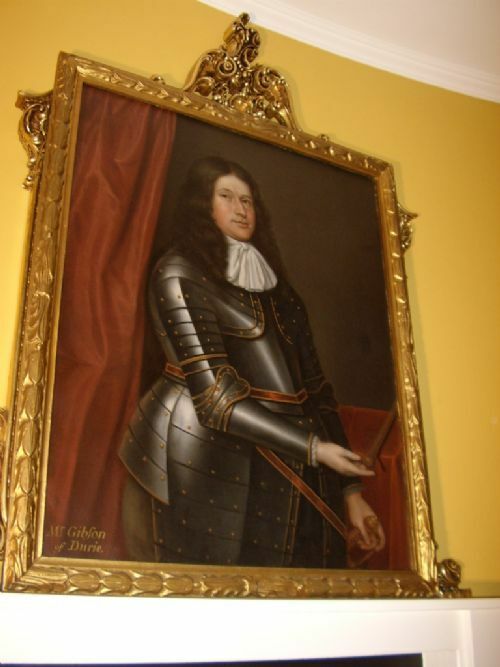 He died in 1679 at Wemyss Castle in Fife, whose estate he had done much to develop. David Scougall may have studied with John Michael Wright, whose work he certainly copied, but very little is known about this portrait painter aside from the works signed by or attributed to him and a few surviving accounts. 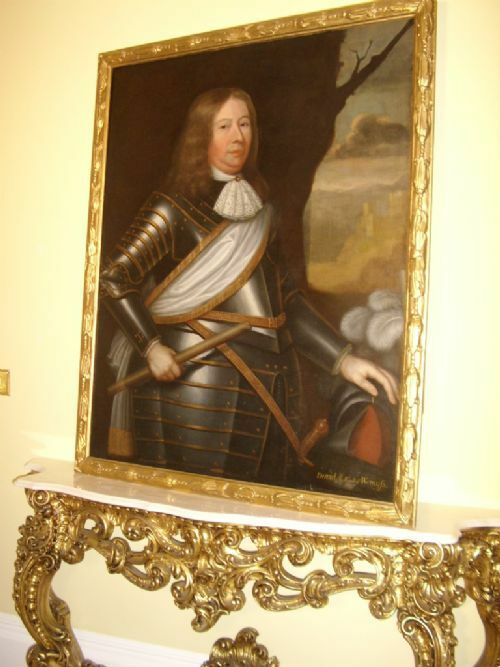 His clients included some of the most powerful people in Scotland, for example, Archibald Campbell, Marquis of Argyll, whose daughter Scougal also painted in 1654. 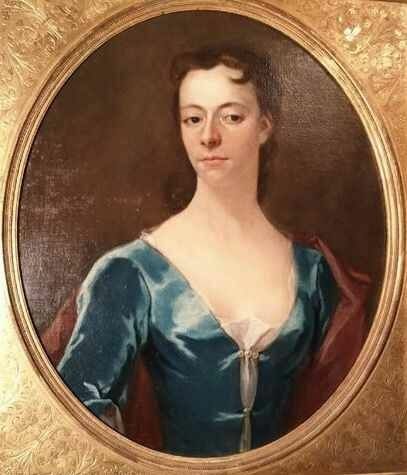 His son or nephew, John Scougal, was also a portrait painter and some of his early works may have been confused with those of the older artist. Good condition commensurate with age after completion of restoration works. Signs of an old reline still all good and having had replacement stretchers many years ago. Painted surfaces are generally fine with just afew areas of overpainting although colours are still vibrant and sharp after good clean and light re-varnish to finish. All works carried out by experts in their field. 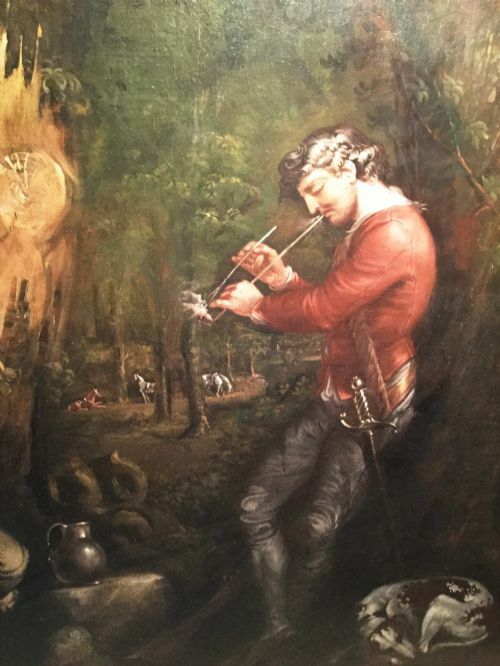 Mr.Gibson of Durie looks confidently towards the artist with concentration and pride gesturing with his right arm out stretched with sword seen held in his left hand. Mr.Gibson wears his full suit of gleaming armour almost tailored to his substantial size,a weightly looking gentleman of distinction and social standing. Very good condition indeed after completion of full professional restoration to a high standard. 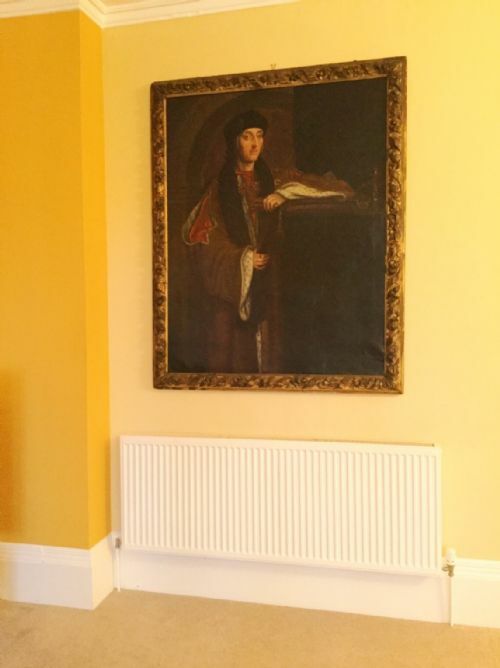 Painted surfaces are all fine and colours are still vibrant and sharp after clean and light re-varnish.All works carried out by experts in their field. 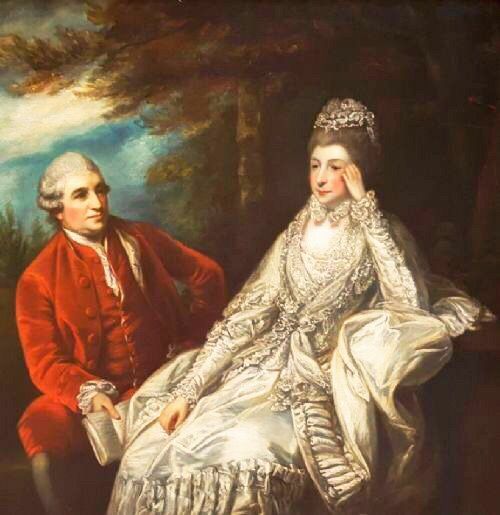 David Garrick and Eva Maria Garrick (née Veigel), richly dressed, and conversing in wooded landscape. The painting follows the fashionable convention of the conversation piece, a (usually) small-scale portrait showing two or more people, often out of doors,with the smaller versions being about the same size as a half-length portrait but in horizontal or "landscape" format. Having had their origins in the 17th century Netherlands, they were also very fashionable in Britain in the 18th century. They are distinguished by their portrayal of the group apparently engaged in genteel conversation or some activity, very often outdoors. Typically the group will be members of a family, but friends may be included, and some groups are of friends, members of a society or hunt, or some other grouping. Other notable artist working in this genre were Arthur Devis, William Hogarth, Johann Zoffany, and George Stubbs. The original is in the National Gallery London. Garrick made his first appearance on the London stage in 1741. His distinguishing characteristic was what Samuel Johnson called his 'universality'. 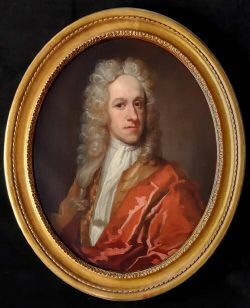 A close friend of Reynolds, he was painted by the artist on several occasions, notably as The Actor torn between Tragedy and Comedy, in 1762. 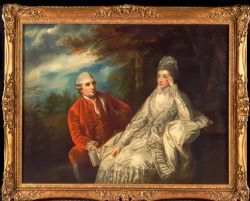 In this portrait by the artist, David and Eva Garrick, the Viennese dancer whom he married in 1749, are depicted in the garden of their country house at Hampton in Middlesex. Very finely depicted figures and attire. The facial features of the lady (lips, cheeks, nose) are remarkable. The impasto technique with the thickly applied paint is very effective and very beautiful. Held in an excellent condition swept frame. 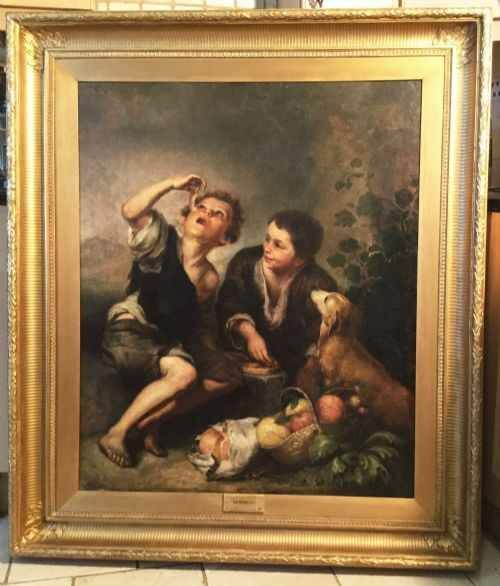 This exceptionally rare and fine example of one of Reynolds well known works is probably the only other in existence after the original bought by The National Gallery London in 1981. 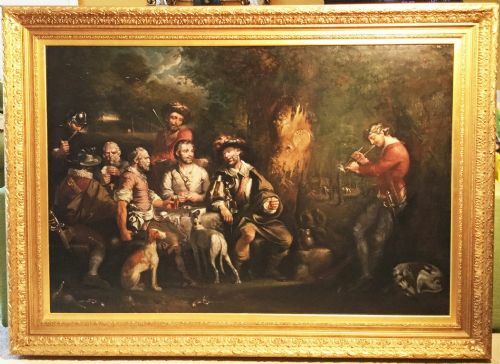 We must say that in our opinion our recently acquired version could possibly be another work from Reynolds studio and possibly an earlier forerunner to his larger painting of Garrick. 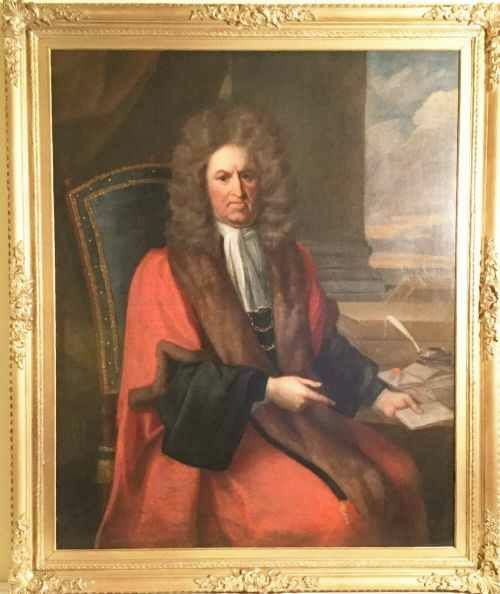 The portrait we offer is technically not strictly a copy as the artist has painted Garricks Coat with just four upholstered large buttons,whereas the larger version in the National Gallery depicts Garrick with five buttons. 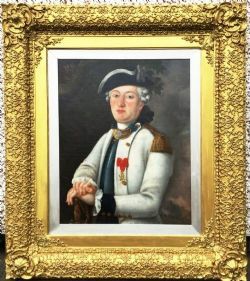 Surely the best copyists would not make such a basic mistake had they been carefully producing an accurate copy.This fact suggests that two versions were produced around the same time 1772 and that the smaller painting we offer for sale may in fact be an earlier sample of the work. We only suggest this as a sensible analysis but do say our painting is definitely of the correct period around 1772 (late18thc) and that it has been produced by either Reynolds studio under his influence within his Circle or possibly by his studio assistant of many years Giuseppe Marchi. * Interesting Article Link ( Copy & Paste ) About copies achieving record prices at auction. Attributed to Thomas Hill 1661 - 1734. Initialed on the letter on the table T.H. 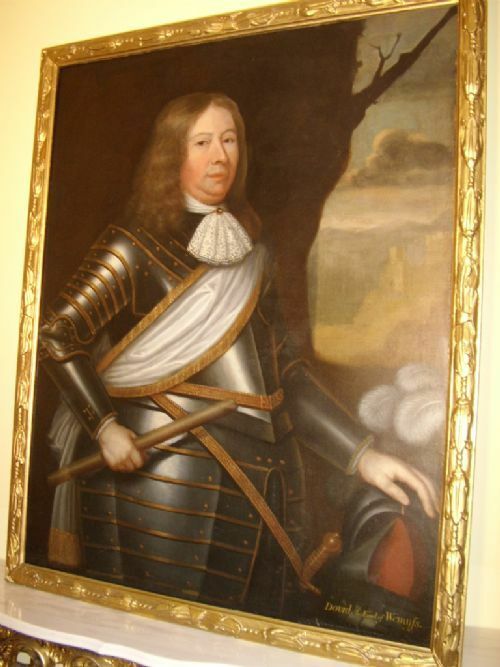 Robert Dormer was the second son of John Dormer, Barister of Lee Grange & Purston, Buckingham. He was baptised at Quainton near Aylesbury on 30th May 1650. He entered Lincoln`s Inn in May 1669, called to the bar in January 1675. He later became Chancellor of Durham. 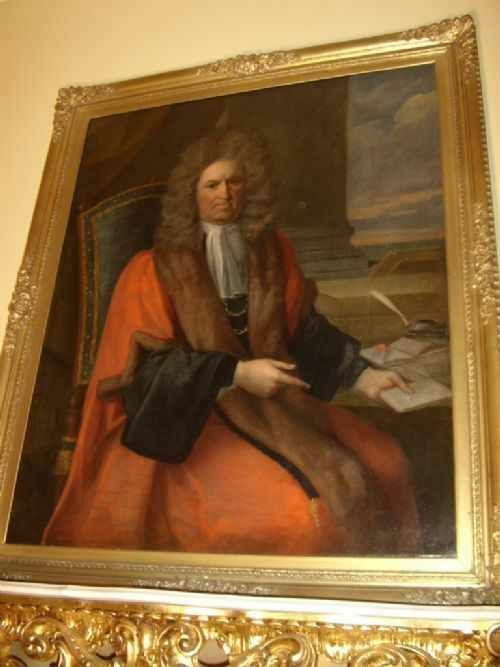 He entered parliament as a member for Aylesbury in 1698. In 1701 & 1705 he was elected as M.P. for the county of Buckinghamshire. 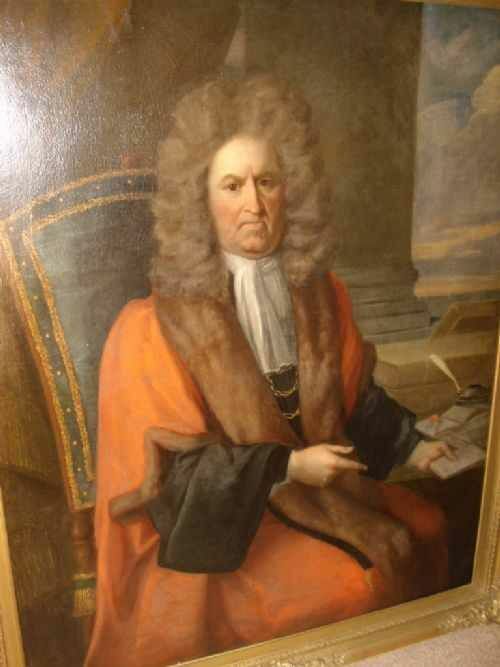 On 28th November 1702 he became M.P for Northallerton. He was raised to the bench of the common pleas on 8th January 1706. 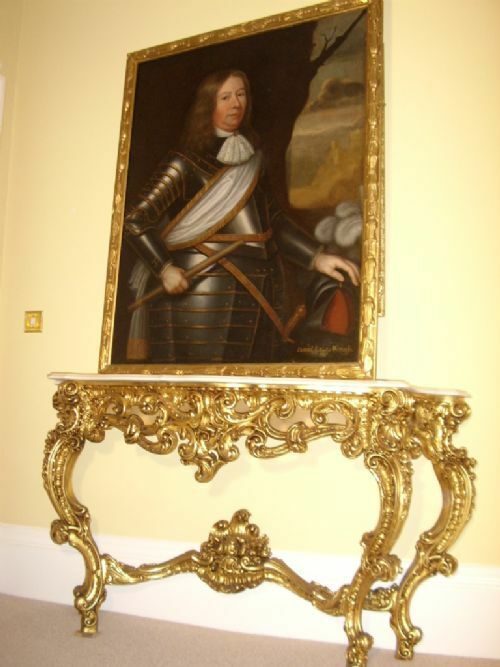 His seat was at Arle Court near Cheltenham, Gloucestershire. 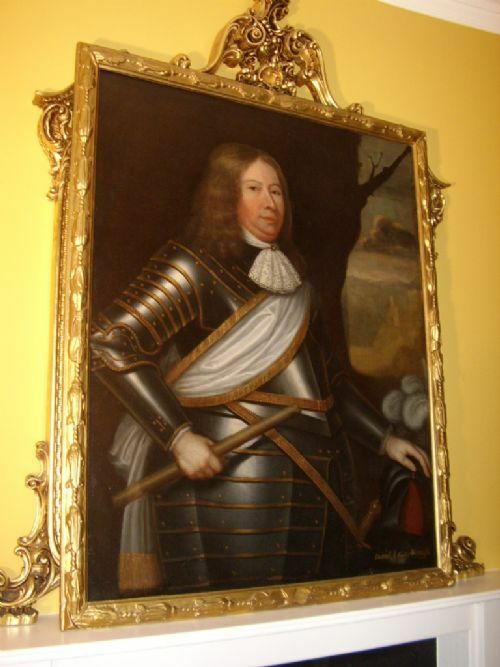 He inherited Lee Grange & Purston from his nephew Sir William Dormer 2nd Bt. He died on 18th September 1726 & was buried at Quainton. In the tower of Quainton Church you will find a fine monument to Sir Robert Dormer & his wife & son. 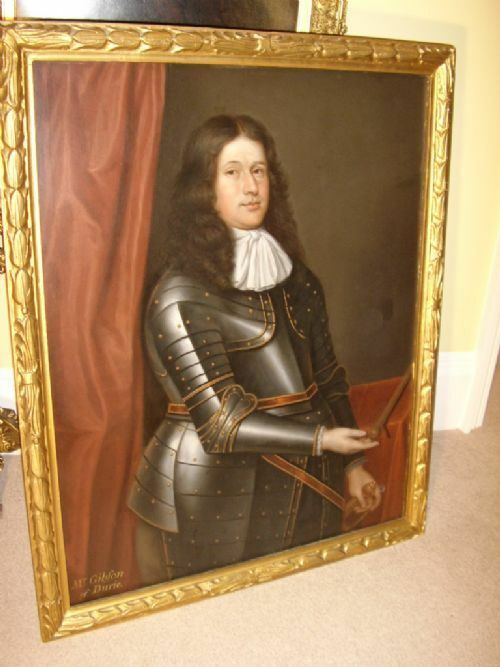 Approximate date is estimated to be between 1695-1710 latest. A fine decorative period plaster & gilt example in good condition. 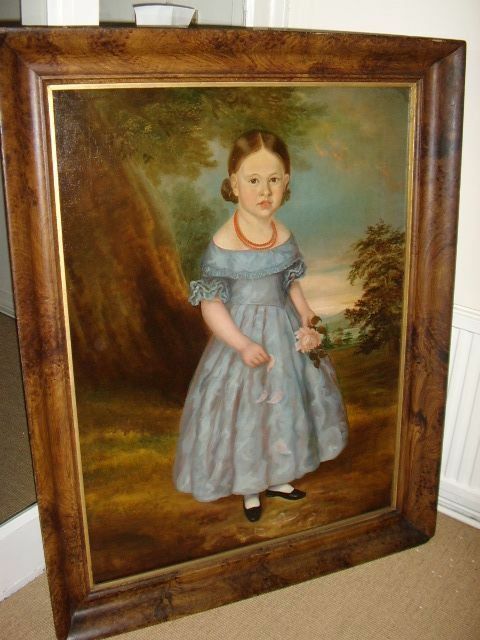 the portrait is now in very good condition for its age,having already been wax re-lined around 20 - 30 years ago. 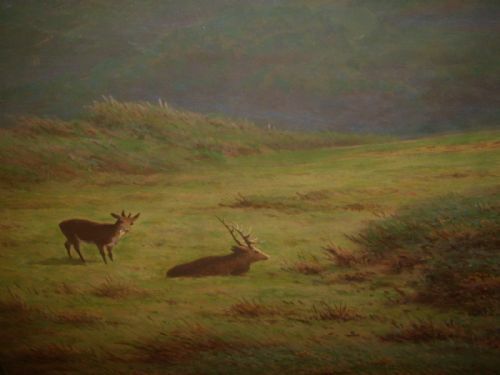 J.Knight,depicting a moorland landscape scene with deer. 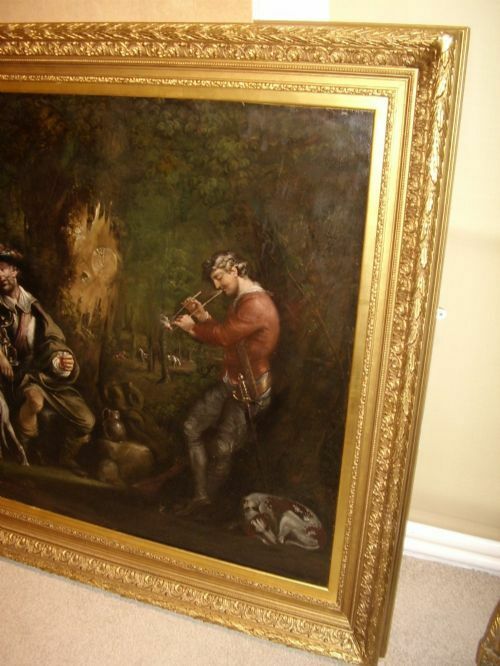 This fine example is in excellent condition and is protected under the original glass. 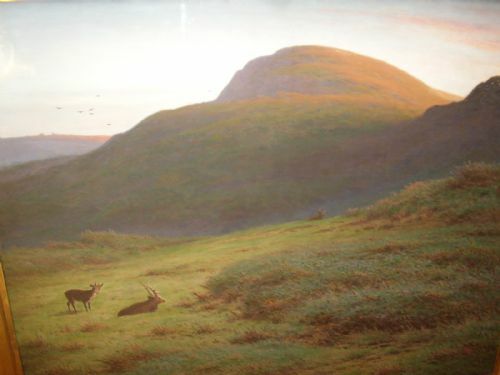 This fine painting finished in Pastel & Gouache captures perfectly the steamy mist and dewey dampness of the moors,with the green grassy colours changing intensity in the various applications of sunlight and daylight,a true realistic landscape having depth and realism to stir most imaginations. All very well scaled and just like looking through a real framed window bringing the outside inside. A beautiful swept original frame made from cast gesso and recently fully re-gilded throughout,and now looking absolutely stunning. The frame has had some previous old repairs. Knight was a member of the Manchester Academy of Fine Arts, joining in January 1868. He withdrew in 1879 and was re-elected in 1883. He was also elected a member of the Dudley Gallery, the Royal Institute of Painters in Water Colours, the Royal Etchers, the Royal Cambrian Academy of Art, the Limners Club and Art-Min-Afon, Betws-y-Coed. In 1874 he was a Royal Manchester Institution prize-winner and in 1891 he won a bronze medal at the Paris Exhibition. The Manchester School of Painters was formed by a number of disgruntled young vanguard painters in the 1870s. They were deeply influenced by the artist, Joseph Knight who was a successful painter, etcher and photographer. He was the founder member of the Manchester School of Painters. Knight painted how “he” desired and refused to conform to traditional Art School rules and this appealed to his young admirers. Twice weekly they would all meet up at Knight’s studio in York Place behind the Union Chapel in Oxford Road, Manchester to discuss new ways to develop their techniques. A quality large oil on canvas portrait of a beautiful young girl shown in a pale blue satin and lace dress,posing whilst holding a pink rose,wearing a double string necklace of carnelian beads. Very Good Condition for age and recently carefully cleaned. A beautiful and wonderfully hand crafted heavy frame,being 4 inches deep,and finished with a hand painted burr walnut immitation finish which looks authentic and makes the piece. 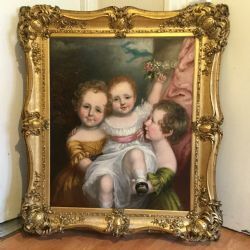 This is a beautiful large scale early 19th century oil portrait painting on canvas depicting three young angelic looking children,‘ studio of ‘ Sir Thomas Lawrence being attributed to one of his pupils and possibly produced under his influence. 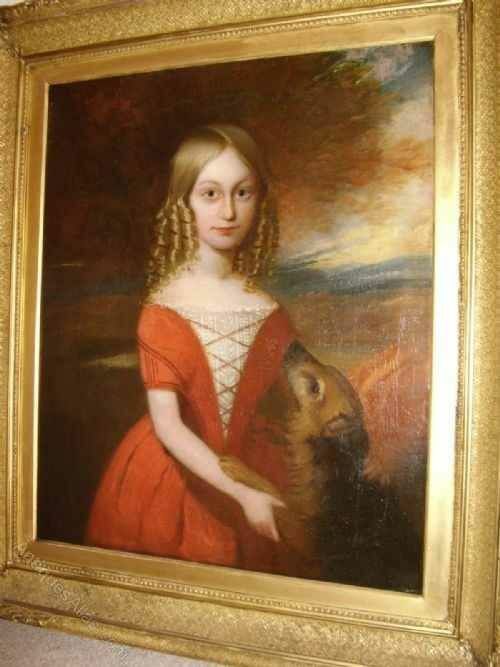 Lawrence is well known for producing a portrait of The Calmady Children (Emily, 1818–?1906, and Laura Anne, 1820–1894) Emily and Laura Anne were the children of Charles Calmady of Langdon Court in Devonshire. Their portrait— shown at the Royal Academy, and engraved under the title Nature—has always been one of Lawrence's most popular works. 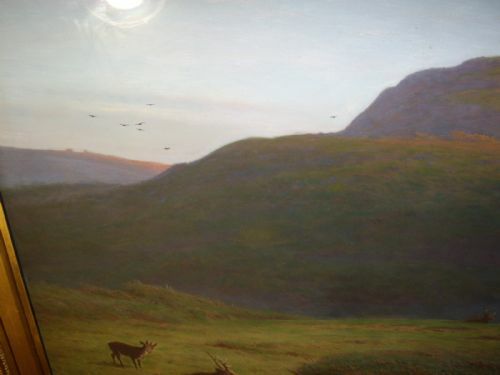 This fine example is on display in The Metropolitan Museum Of Art In New York and bears similarities to the painting we have offered for sale. His studio produced many copies of his best known works to meet demand and these were often completed by his pupils or studio assistants. In his latter years the artist struggled financially and with his health and so moved back to his family address in Greek St London from where he tried to keep up with demands for paintings. When he eventually died in 1830, there were many unfinished paintings found in his studio which were completed by his pupils and it’s probable that many of these paintings were sold on as originals. 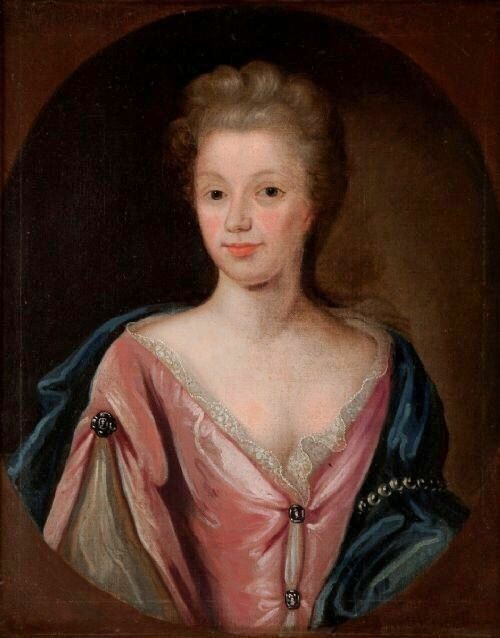 It is documented that whilst he was alive, one of his pupils completed his portrait depicting Mrs. Brandling and so there is certainly a strong possibility that our portrait has been produced from his studio under his influence and perhaps with an helping hand in the accomplished composition, for both he and his pupils engaged in finishing many of each other’s works. 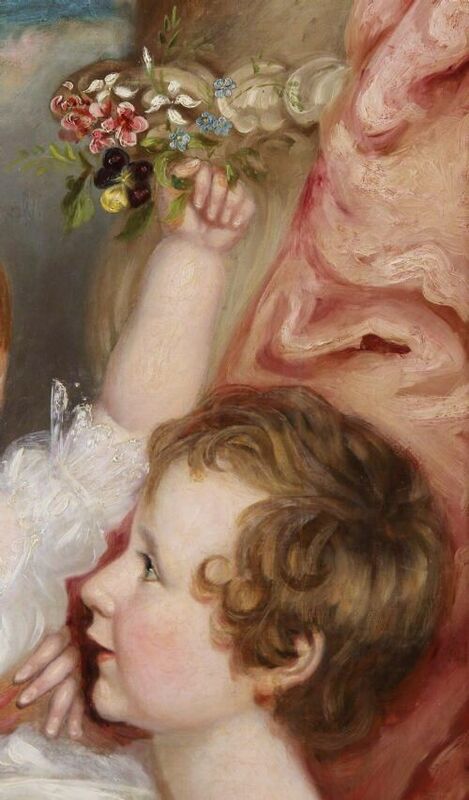 George Henry Harlow was also a pupil but only stayed within his workshop for a short period of 18 months and left after a dispute relating to an altered depiction of one of his well known original works. 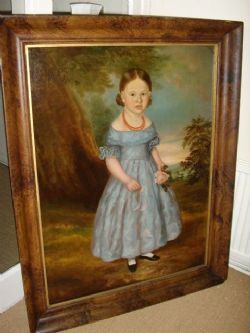 Many artists have tried to reproduce almost identical works, more so with the Calmady Children, but our example is not a copy of this famous portrait but poseses all the attributes of his hand in manner and character,but is itself an original of the time the artist lived and is a rare find to be able to purchase today. 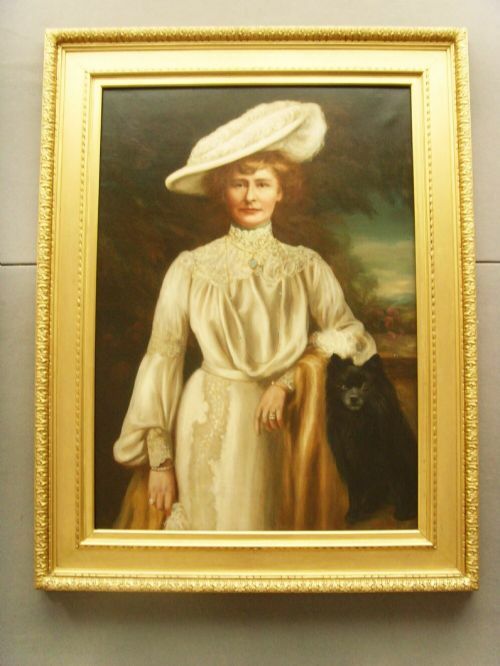 We are pleased to offer for sale this lovely three quarter length portrait of an elegant Lady, standing with her chow chow dog beside her, by the Scottish artist John Horsburgh 1835-1924, who has signed the painting Horsburgh Edin' and indistinctly dated it, possibly 1901, in the lower right hand corner. 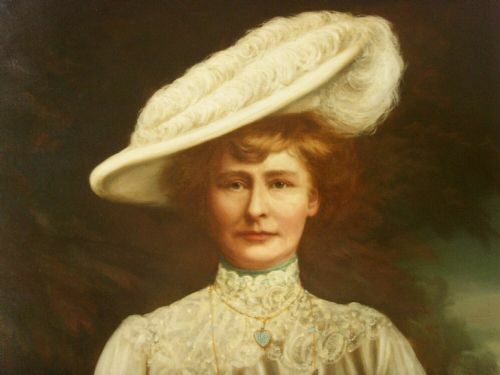 The lady is wearing a large cream coloured hat decorated with ostrich feathers on her upswept auburn hair. 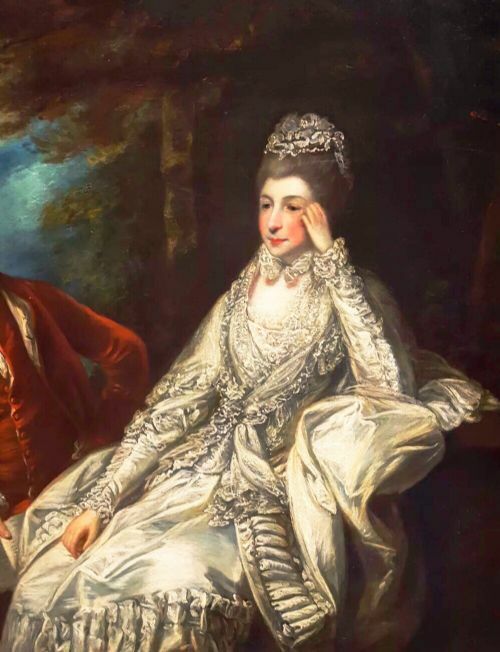 She is wearing a cream, high necked tea gown, decorated with cream lace on the bodice, down the skirt, around the upper sleeves and on the wrist, and has a gold coloured wrap edged with cream feathers draped over her wrist. The lace neckline of the dress is backed by turquoise material, which matches the turquoise jewellery that she is wearing, including a heart shaped pendant, a long gold necklace with turquoise beads, and two diamond and turquoise rings, as well as a diamond bangle on each wrist and a diamond ring on her right hand. 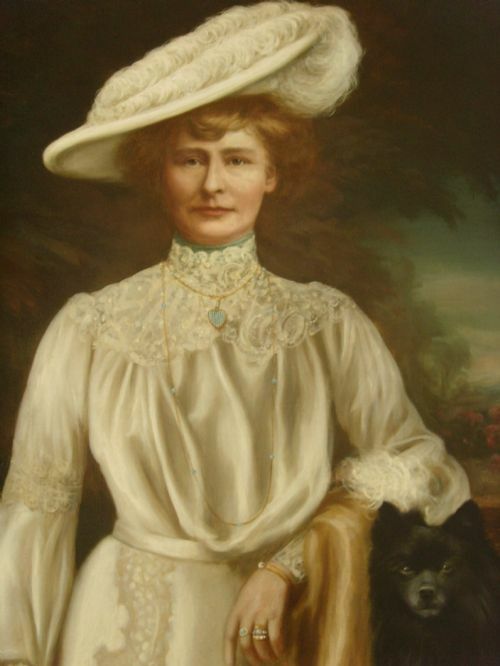 We thought it might be interesting to discover the history of the chow chow dog in Scotland and found that a lady by the name of Lady Dunbar of Mochrum wrote a book about chows in 1914, which had two more editions published until 1924 and is still well regarded today. 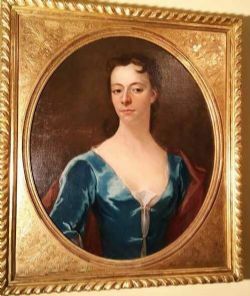 We saw a photograph of this lady with two of her blue chows and it is therefore a strong possibility that this is her, but details about her are limited, other than that we think she was the wife of the 9th Baronet of Mochrum. John Horsburgh, 1835-1924 was born on 6th February 1835 in Eddleston, Peeblesshire, the son of a shoemaker. He was apprenticed to a silk mercer in Edinburgh in his youth, but his interest soon turned to photography, and by 1863, he had set up his studio in Edinburgh in South Bridge, which moved briefly to 17 Princes Street and finally to 131 Princes Street by 1868. By the 1871 Census, he was living at 13 Abbortsford Park Edinburgh and he was employing 3 photographers and 3 artists, presumably to colour in the photograhs, which was often done in those times. In the 1881 Census he was a man of 46, listed as an Artist and Photographer and living at 10 Strathearn Road. 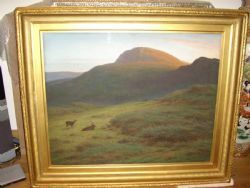 Between 1889 and 1898, his business changed to John Horsburgh & Son (This son being John Alfred Horsburgh, born 1862, who also painted). In 1891 he was living at 'Albania', 48 St. Albans Edinburgh where he was working from home as an Art Consultant and Painter. After 1898, when John Senior retired from the photography business, the business became John A. Horsburgh until 1915 at 4 West Maitland Street. 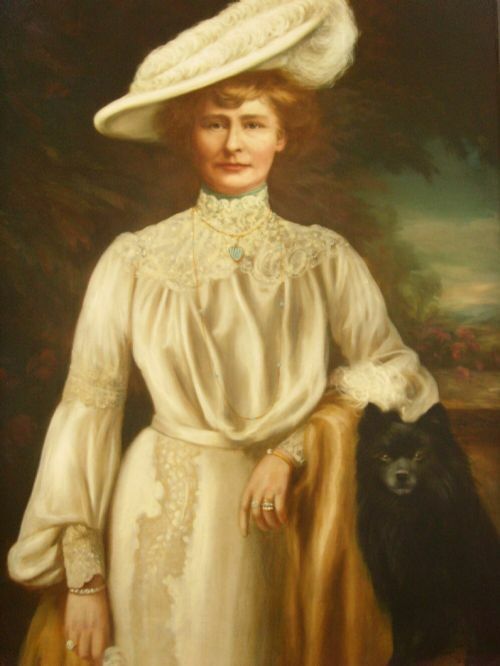 By the 1901 Census, he was listed as a Retired Artist and Portraitist at Aberdour House, Aberdour, Fife. (This house was used by Admiral Beatty of Jutland fame during WWI) However, he was still offering his services as a portraitist in the 1920s, according to his letter head, where he offered portraitute without tedious life sittings at The Langham Hotel in London, in private residences, chambers and clubs, and in Corstorphine in Edinburgh. Possibly he based his portraits on photographs to avoid the sittings). At some stage, he was apparently elected a Fellow of the Royal Scottish Society of Arts, as some of his paintings show FRSSA after the signature. John Horsburgh died at the end of September 1924, as his obituary appeared in The Scotsman on 1st October 1924. Anyone wishing to see more examples of his work, details of his family life (he had 10 children by his wife Agnes, nee McIntosh, who he married in 1856, 8 of whom survived him). Very, very good. 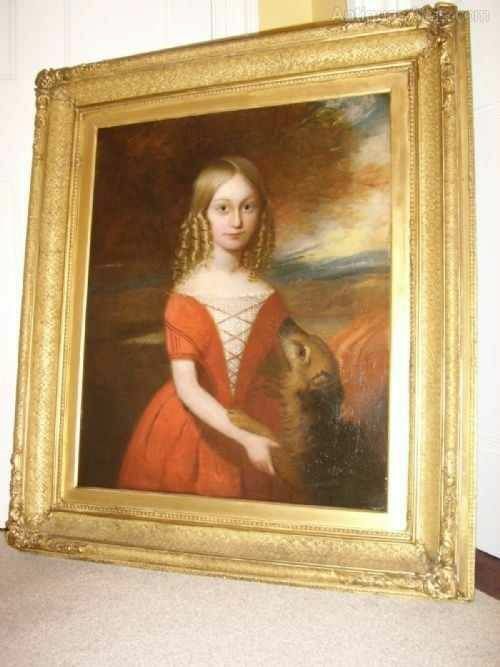 The painting is clean and there are no repairs, craquelure or other damage. 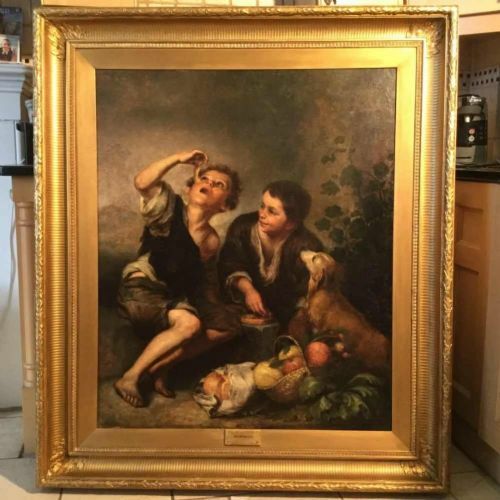 The original frame is also in very good condition. I am delighted to offer for sale a quality three quarter length oil portrait on canvas of an Aristocratic Lady in all her finery. This beautifully rendered and impressive large scale portrait from the mid 18th Century circa 1750 depicts the lady in a garden setting. 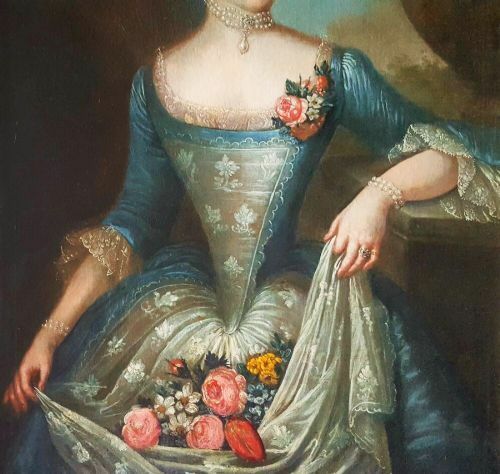 This elegant young lady of aristocratic appearance is portrayed wearing a fine blue silk boddice embellished with satin and with a plethora of colourful flowers gathered within the fullness of her dress. The pallete of blue, white and pink, favoured by the late baroque painters, create the perfect harmony of colour. 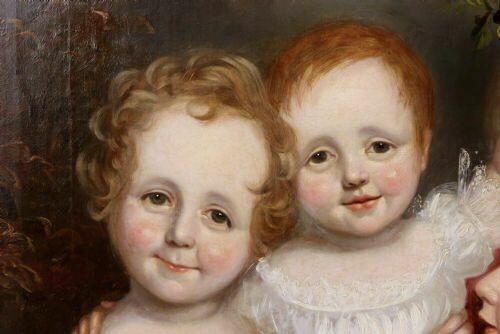 This is an attractive image having soft modelling of forms and depicts a gentle oval of the face with slightly rosy cheeks and is the epidemy of the Rococo portrait. 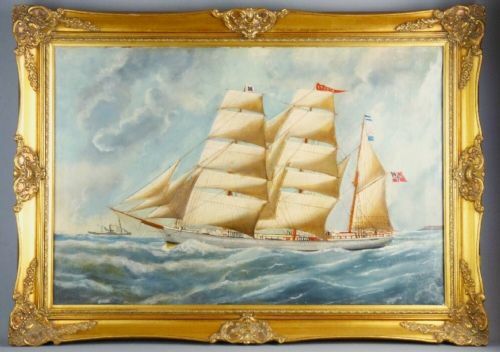 Large Late 19th Century Oil Painting on Canvas of The Three Masted Vessel named PRONTO. 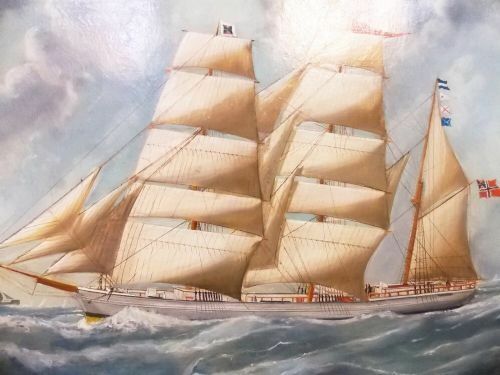 This painting provides the only detailed visual record of the vessel at sea other than the official black and white ship builders blue print plans. The PRONTO was a wooden barque built by B Balchen & Co, Norway, in 1892. Technical and configuration specifications are given as 369gt, 347nt; 141ft 1in length x 29ft 4in breadth x 12ft 1in depth; 1 deck. 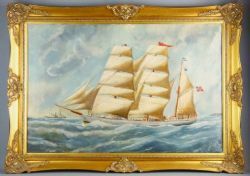 At time of loss on 21 April 1895, the barque was still owned by its builder and under the command of master O A Hagen. It was on passage from Mauritius to Garston with a cargo of sugar when it ran ashore at Porth-Post and became stranded. 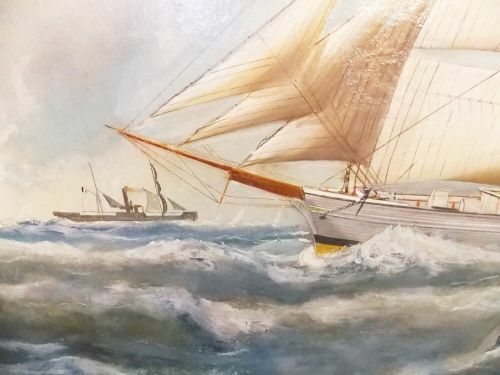 A barque, barc, or bark is a type of sailing vessel with three or more masts having the fore- and mainmasts rigged square and only the mizzen (the aftmost mast) rigged fore-and-aft. Archaeological remains associated with the loss of this vessel are not confirmed at this location, but may be in the vicinity. 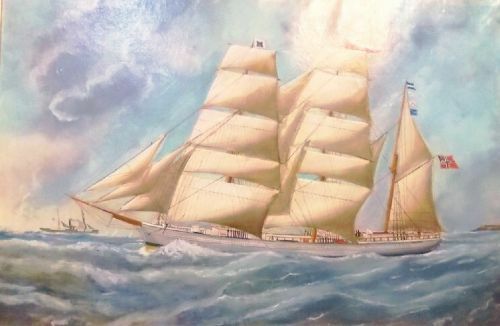 Lloyds Register of British and Foreign Shipping 1 July 1893 - 30 June 1894 number 849. Cleaned and Re-varnished / Past Reline & Slight Restoration. wonderfully painted and colourful 18thc French school portrait of a gentleman officer of high rank depicted in his formal military attire,with his hands resting confidently on the handle of his sword. 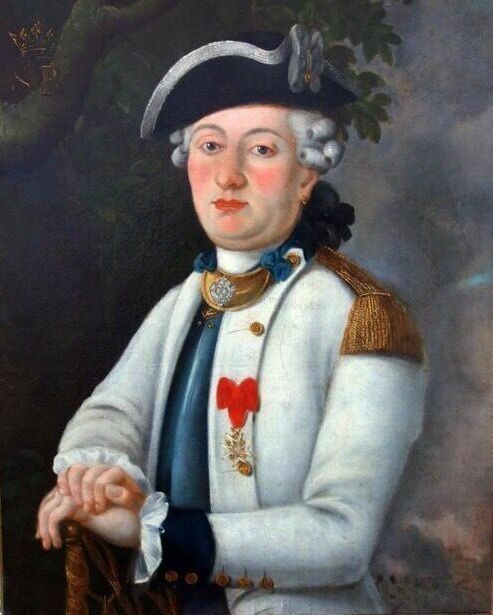 He wears an officers white long coat with matching lapels, his sleeves decorated with multiple brass buttons and gold braided epaulettes dress his shoulders.Below his chin he wears a gold silk cravat held in situ by two small blue velvet bows tied either side and finished with a silver decorative broach.His shirt is a blue silk under garment of quality. 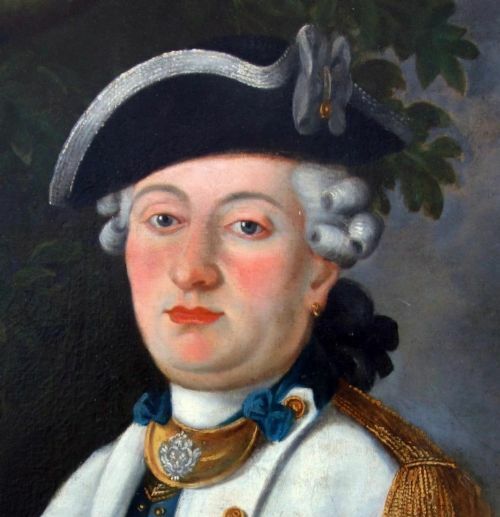 He confidently wears his black bicorne hat decorated with silver braided cockade and finished with a crimped flower on the side. He proudly wears with distinction the Military Order of St.Louis which is suspended from a crimson red heart fastened with honour to his chest. 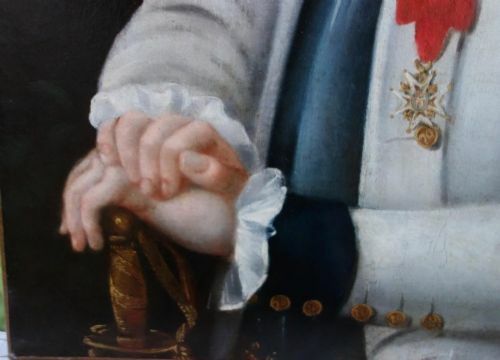 The officers hands are extremely well defined and his appearance is of nobility, his grey powdered hair held in perfect curls and with a gold ear ring pierced through the lobe of his ear. 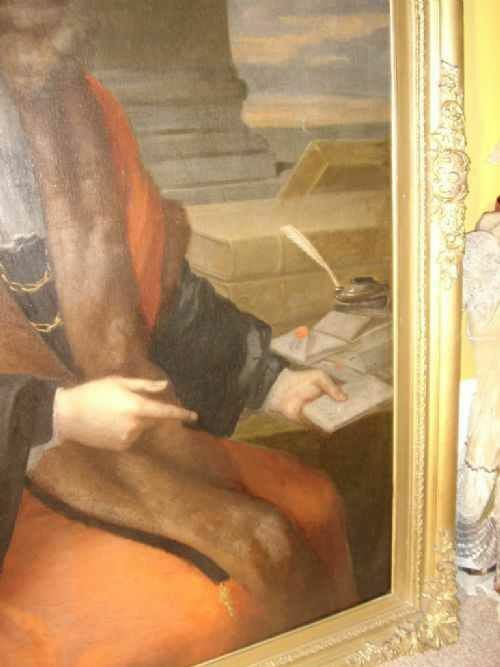 The portrait has been signed with initials S.R below a crown in the top left corner of the canvas. The Royal and Military Order of Saint Louis (French: Ordre Royal et Militaire de Saint-Louis) is a dynastic order of chivalry founded 5 April 1693 by King Louis XIV , named after Saint Louis (King Louis IX of France). It was intended as a reward for exceptional officers, notable as the first decoration that could be granted to non-nobles. 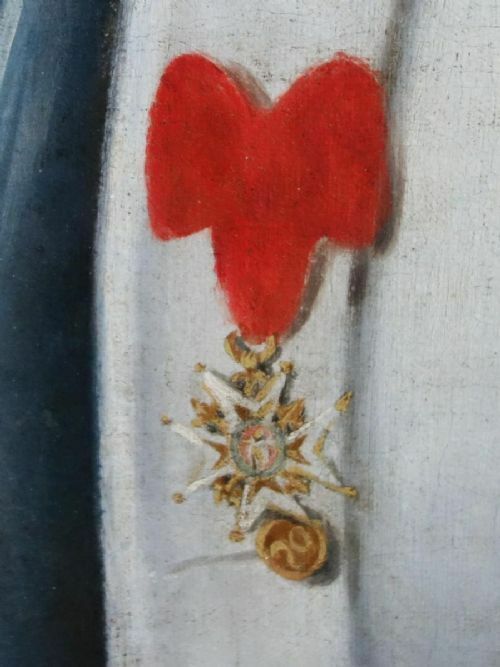 By the authorities of the French Republic, it is considered a predecessor of the Legion of Honour, with which it shares the red ribbon (though the Legion of Honour is awarded to military personnel and civilians alike). Very decorative refurbished plaster and wood frame. The Slip has been coloured Georgian Silver using a gilt wax cream. 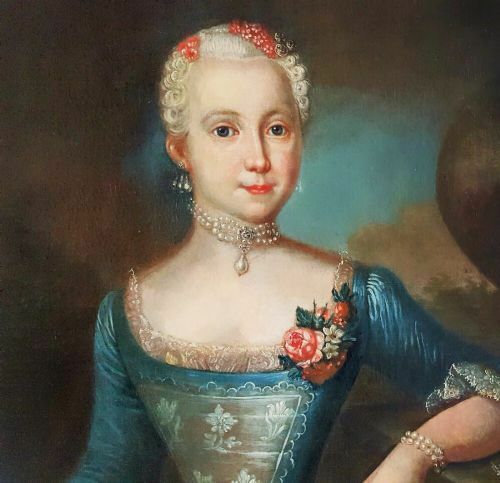 A fine oil on canvas portrait of an elegant young lady depicted posing informally glancing towards the talented artist, who captures the moment perfectly with a view of her wearing a fashionable blue velvet dress and without her wig and finery. 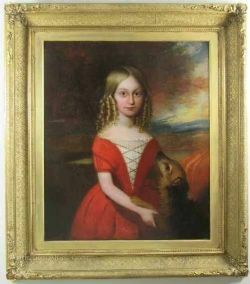 The portrait is nicely presented in an oval slip, being detailed with fine chasing and presented in an outer frame having a rope design. 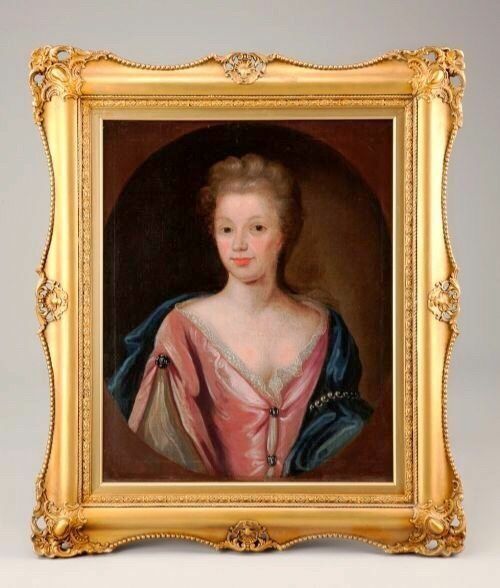 This fine example is by a good competent hand and is in the style and circle of works by Sir Godfrey Kneller. 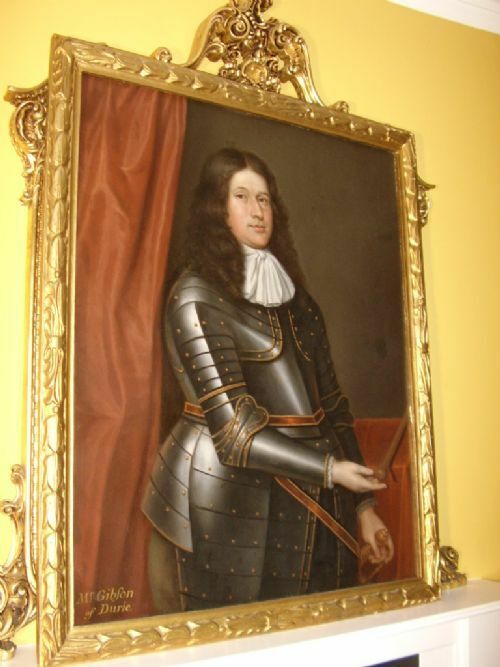 Kneller was born Gottfried Kneller in the Free City of Lübeck , the son of Zacharias Kniller. Kneller studied in Leiden, but became a pupil of Ferdinand Bol and Rembrandt in Amsterdam. They came to England in 1676, and won the patronage of the Duke of Monmouth. 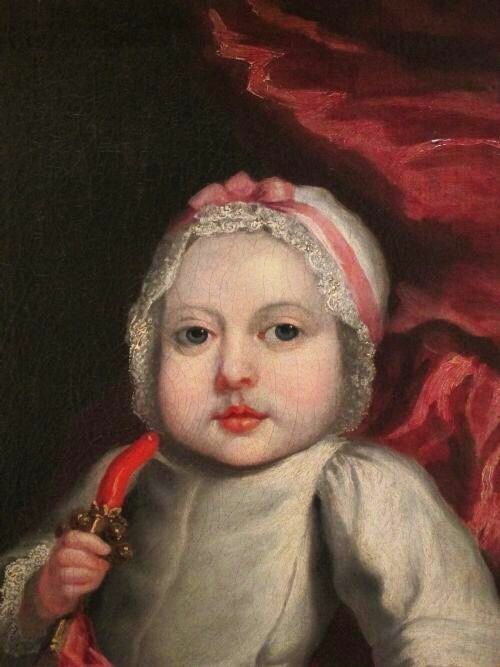 He was introduced to, and painted a portrait of, Charles II. 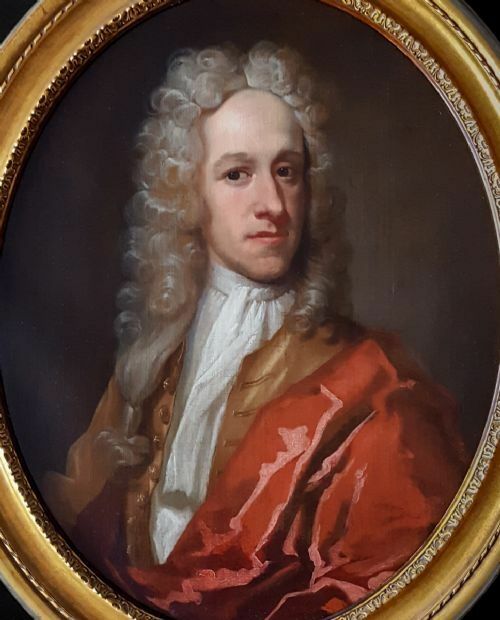 In England, Kneller concentrated almost entirely on portraiture. He founded a studio which churned out portraits on an almost industrial scale, relying on a brief sketch of the face with details added to a formulaic model, aided by the fashion for gentlemen to wear full wigs. 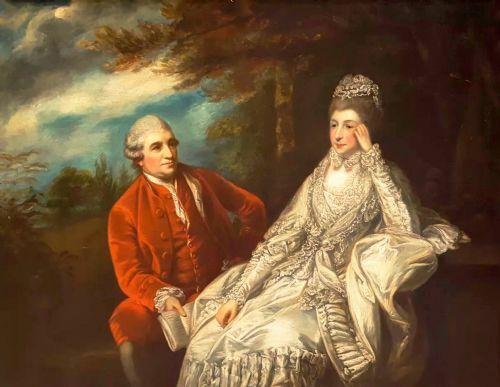 His portraits set a pattern that was followed until William Hogarth and Joshua Reynolds. The portrait is competatively priced to sell and would be a lovely compliment to any period home or as a noticable addition or interior design piece within most modern room settings. 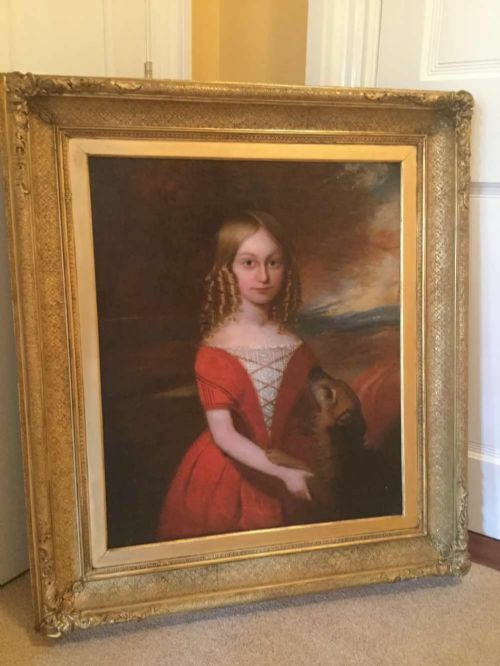 We are delighted to offer a wonderfully painted late 18thc oil portrait on canvas of an affulent young lady wearing a crimson red dress woven with lace and ties across her chest. 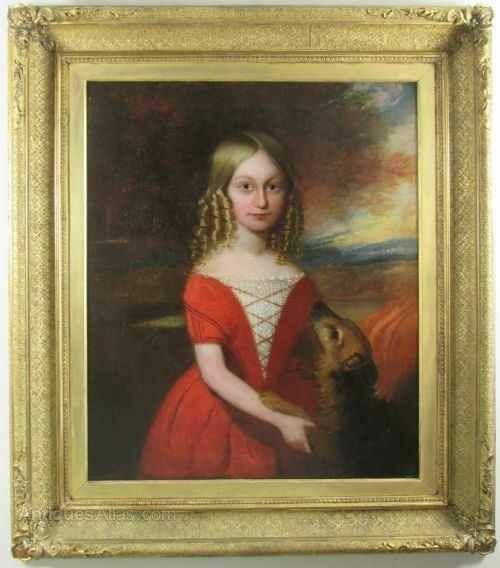 She looks confidently towards the artist,her dark blonde hair beautifully made into bunches of ringlets,with her loyal dog shown with paws in hand,asking for love and attention. The dog by her side was an 18thc symbol of fidelity,loyalty and trust. Fine craquelure commensurate with age. The canvas has tiny old repair patches verso.Looks unnoticeable from the front. We prefer to Receive Payment By Bank Transfer. Jan van Huysum also spelled Huijsum (15 April 1682 – 8 February 1749), was himself a painter of Dutch origin. 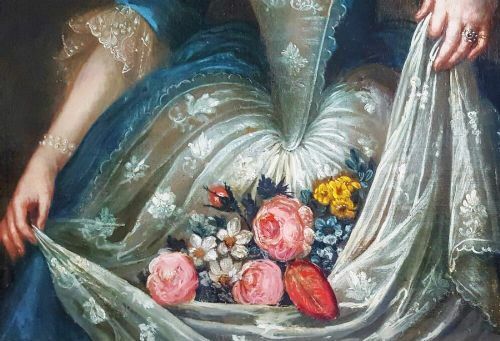 He was the brother of Jacob van Huysum, the son of the flower painter Justus van Huysum, and the grandson of Jan van Huysum I, who is said to have been expeditious in decorating doorways, screens and vases. A picture by Justus is preserved in the gallery of Brunswick, representing "Orpheus and the Beasts in a wooded landscape", and here we have some explanation of his son's fondness for landscapes of a conventional and Arcadian kind for Jan van Huysum, though skilled as a painter of still life, believed himself to possess the genius of a landscape painter. 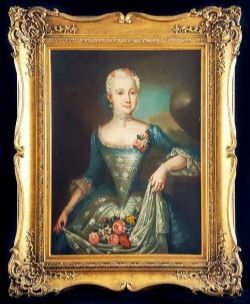 Jan van Huysum's daughter, Francina Margaretha van Huysum, was also a flower painter and may have assisted her father in his work. Half of his pictures in public galleries are landscapes, views of imaginary lakes and harbours with impossible ruins and classic edifices, and woods of tall and motionless trees-the whole very glossy and smooth, and entirely lifeless. The earliest dated work of this kind is that of 1717, in the Louvre, a grove with maidens culling flowers near a tomb, ruins of a portico, and a distant palace on the shores of a lake bounded by mountains. 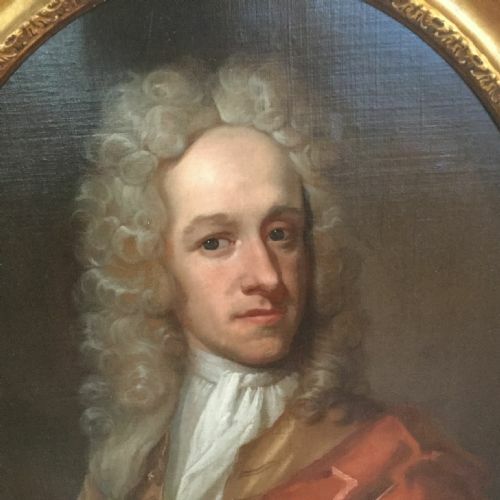 A good quality bust length portrait of Jan Van Huysum 1682-1749 depicted in a brown coat, white neckerchief, and red mantle. He wears a voluptuous blonde wig with a long club-tied lovelock to the side. The painting is comparable with works by the Dutch prolific painter Arnold Boonen on the ground of the handling, pose, and costume. It dates to about 1720 and appears to be by an artist from his circle most notably Philip van Dijk (1683-1753) who was his pupil. Van Dijk went on to become official painter to the court of Landgrave William VIII of Hesse and then to Prince of Orange William IV. Philip van Dijk 1683-1753 was a Pupil of Arnold Boonen in Amsterdam, and also became a student of Adriaen van der Werff in Rotterdam, where he married in 1708. MANNER OF Arnold Boonen (1669–1729), the well-regarded portraitist born in Dordrecht and active in Amsterdam from 1696. He was a pupil first of Arnold Verbuis, and then of Godefried Schalken. Boonen painted genre pictures in the style of the latter, representing subjects by candlelight, but met with such encouragement in portrait painting that he devoted himself almost wholly to that branch of art. His style was well adapted to succeed in it. An excellent colourist, a faithful designer of his model, and highly skilled, he was soon distinguished as one of the ablest artists of his day. Boonen painted some of the greatest members of society such as the Elector of Brandenburg, later King Frederick I of Prussia, the Duke of Marlborough, the Russian Tsar Peter the Great, and Prince William IV of Orange-Nassau. Good Order Throughout & Ready To Hang. 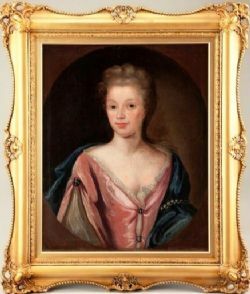 Fine 18thc Oil Portrait of a Lady Circa 1700-1720 Circle of artist Michael Dahl ( 1659-1743) presented in a beautiful gilt decorative frame. 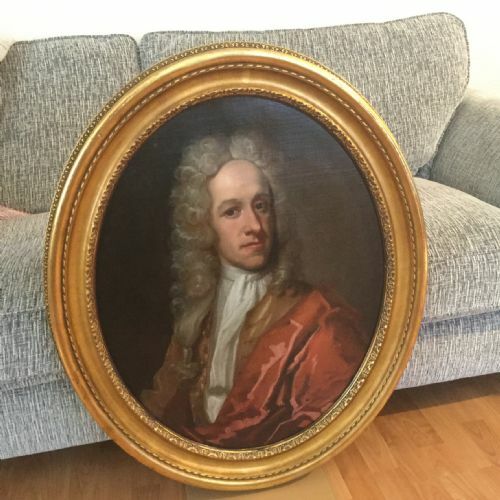 MICHAEL DAHL (1659-1743) was a painter of exceptional talent and regarded as the only really serious rival to Sir Godfrey Kneller, for royal patronage, during the years 1690-1714. Dahl's patterns were undoubtedly indebted to the fashion set by Kneller, but Dahl had a lighter palette, and his brushwork applied in shorter and more careful strokes. Good condition Commensurate with age and ready to hang.